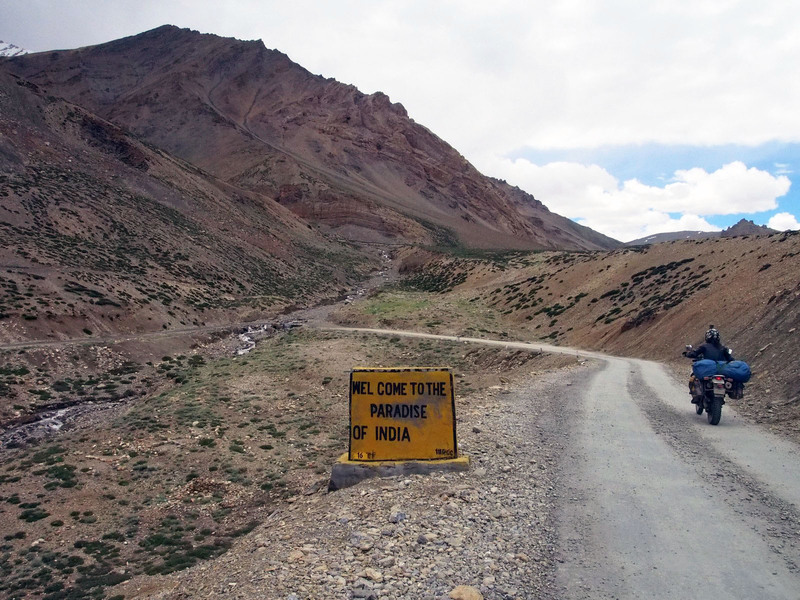 Finally escaping the madness of Delhi, we pushed north. 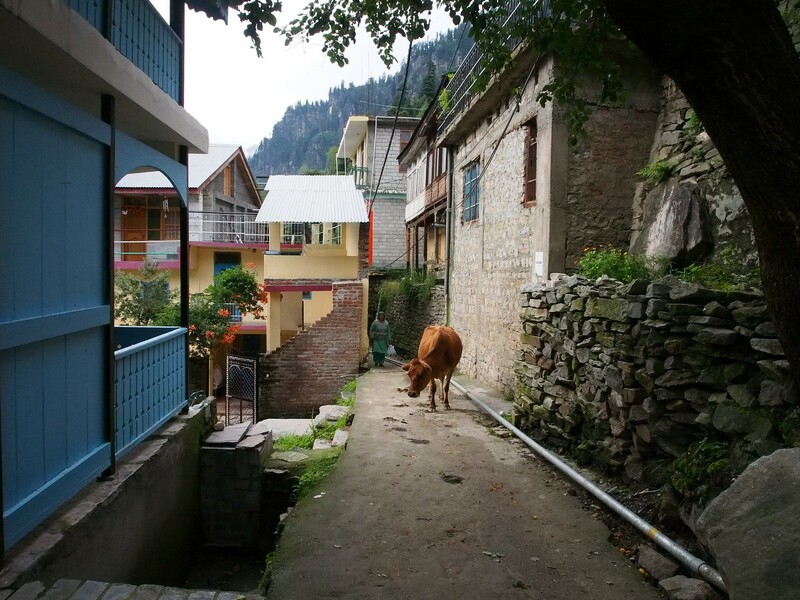 A quick overnight stop in Chandigarh (notable as a completely planned town designed by Le Corbusier; grids of housing linked by roundabouts and a hierarchical system of roads), before starting our climb into the foothills of the Himalayas. 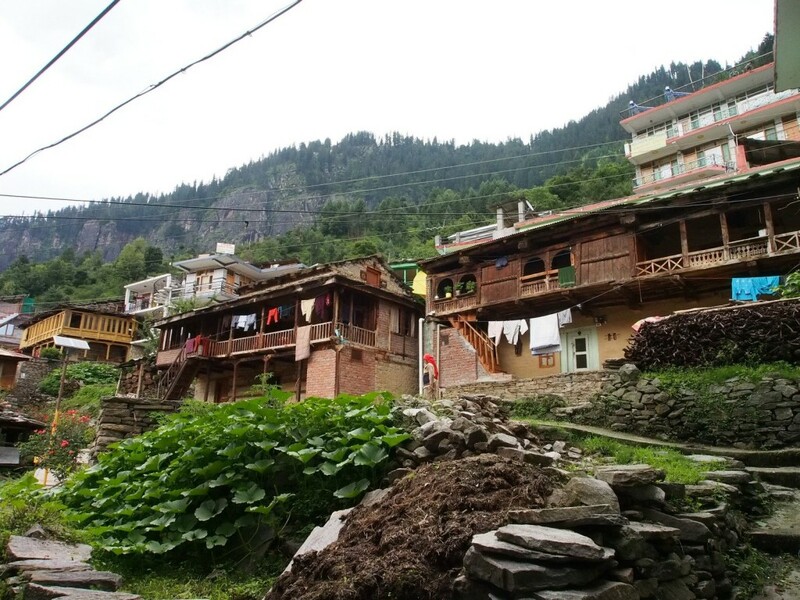 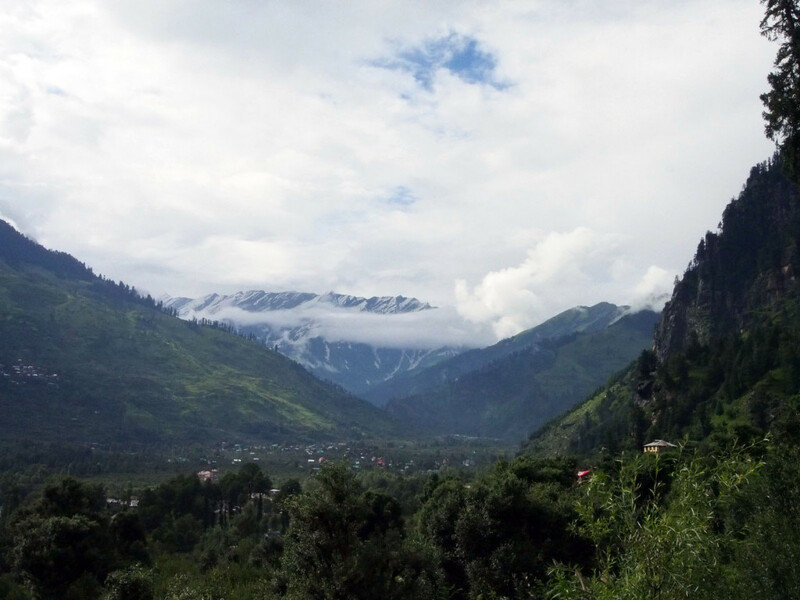 Manali itself is a pleasant resort town, surrounded by verdant green mountains and alpine forests, looking much like Switzerland. 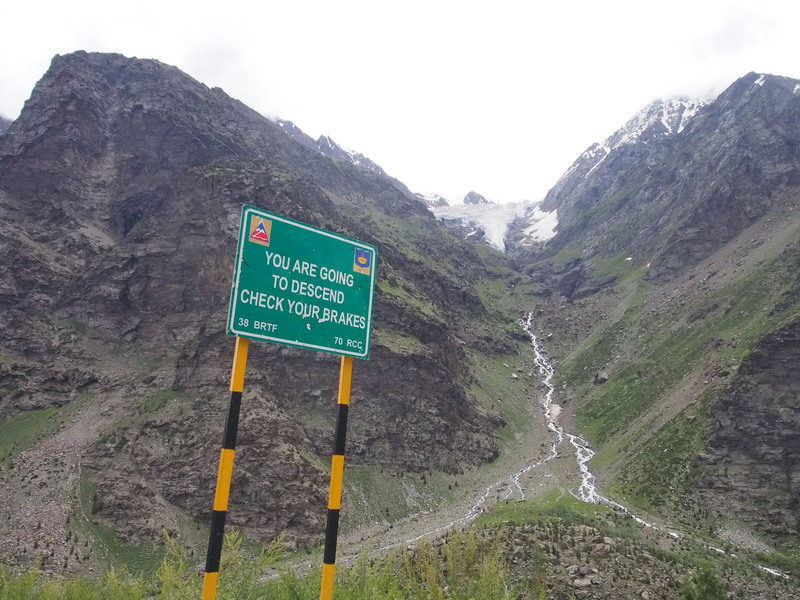 After a few days of resting here (fighting off the after-effects of Delhi), and struggling as usual against Indian bureaucracy for our permits to take the road to Leh, we were able to start one of my most keenly anticipated legs of the trip: the famous Leh-Manali highway. 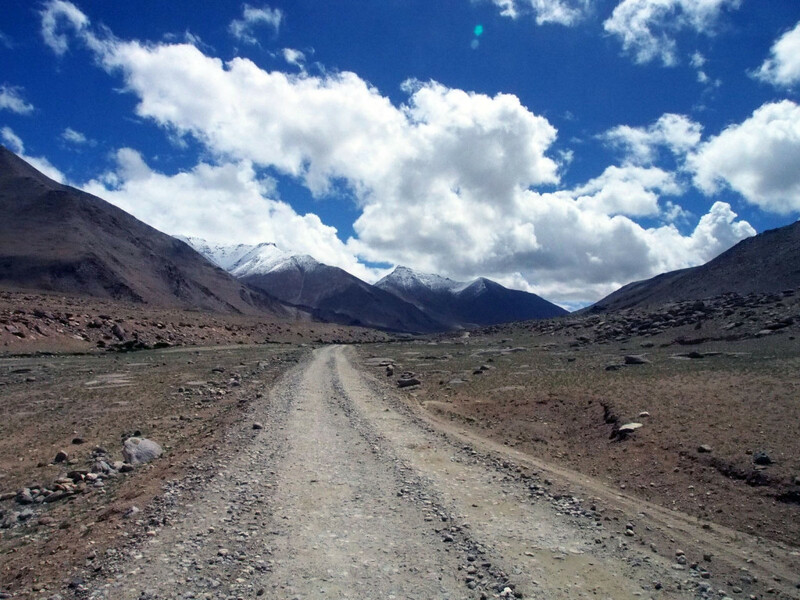 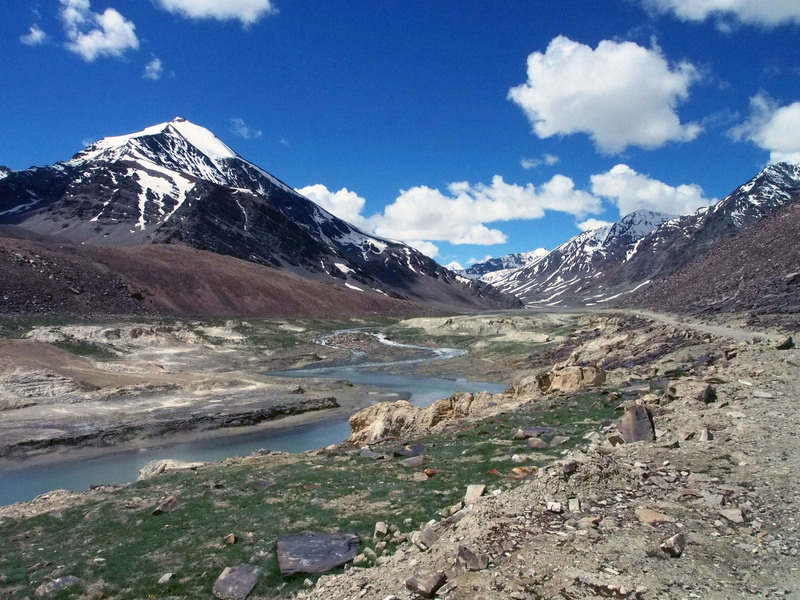 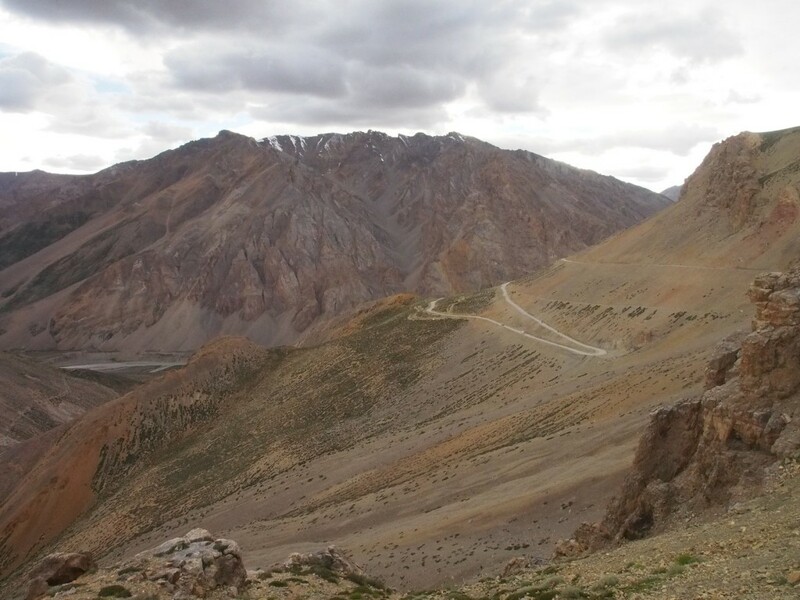 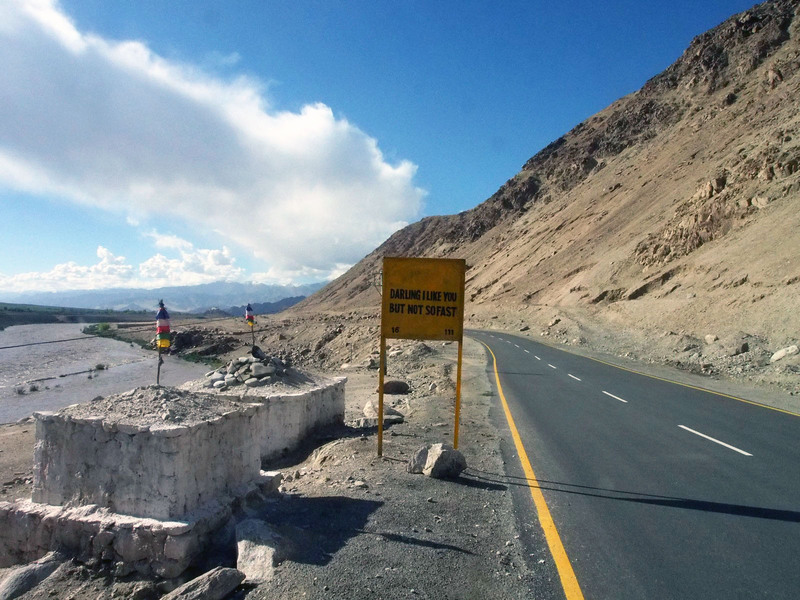 Only open for around five months of the year, it crosses part of the Himalayas through a series of high passes to the Tibetan-influenced town of Leh. 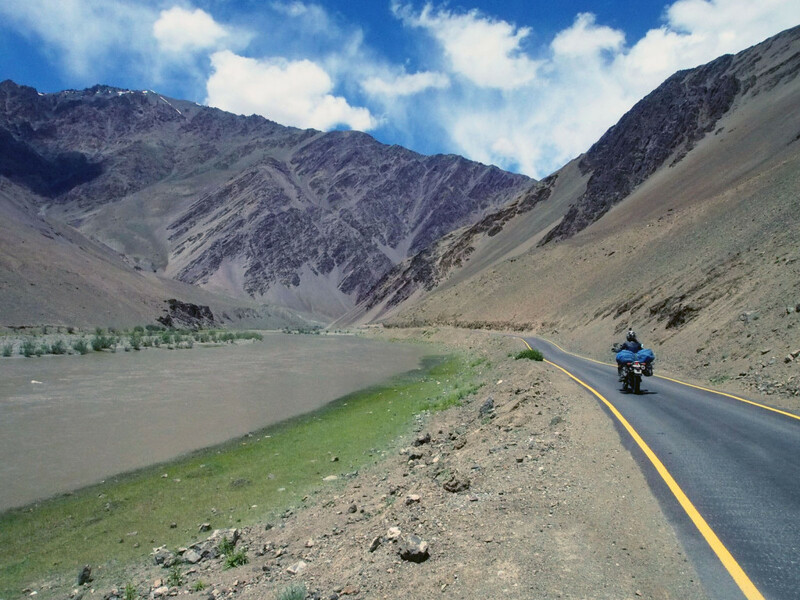 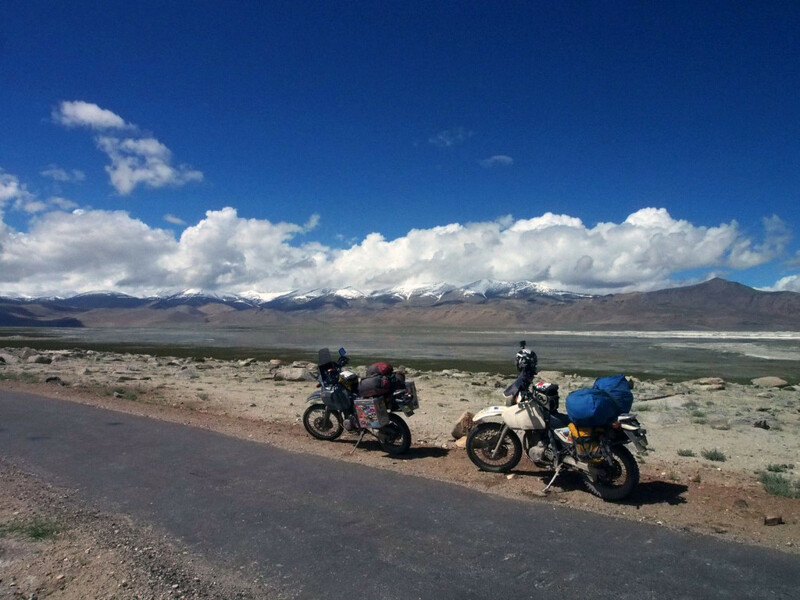 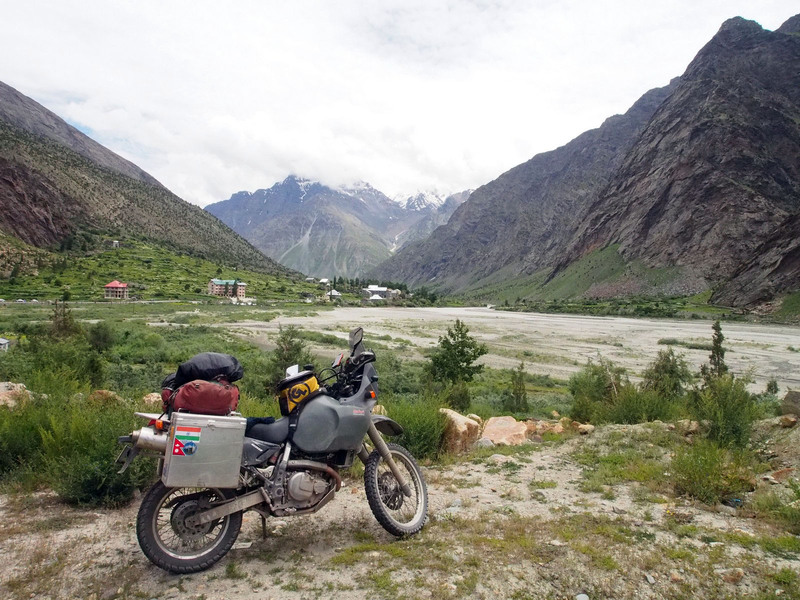 It’s popular both among locals as an adventure ride and among foreign tourists who flock here to rent the local Royal Enfields and ride ‘the roof of the world’. 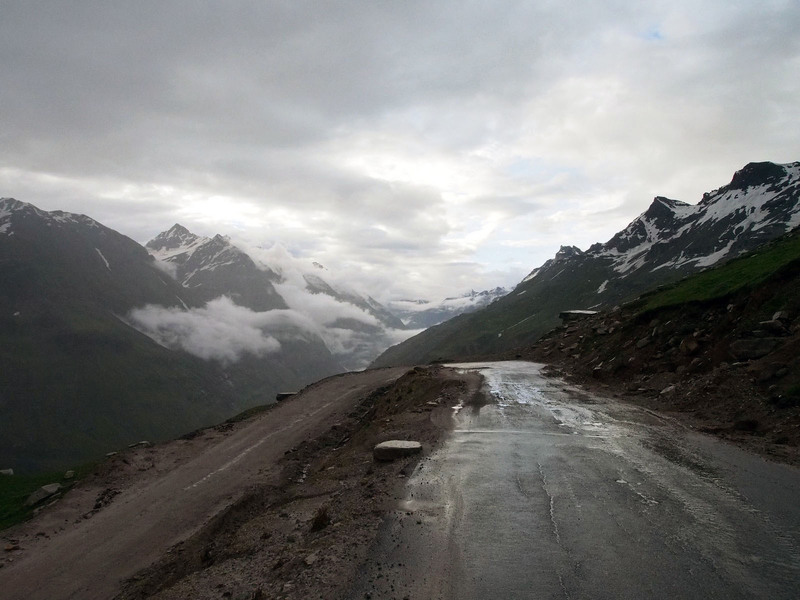 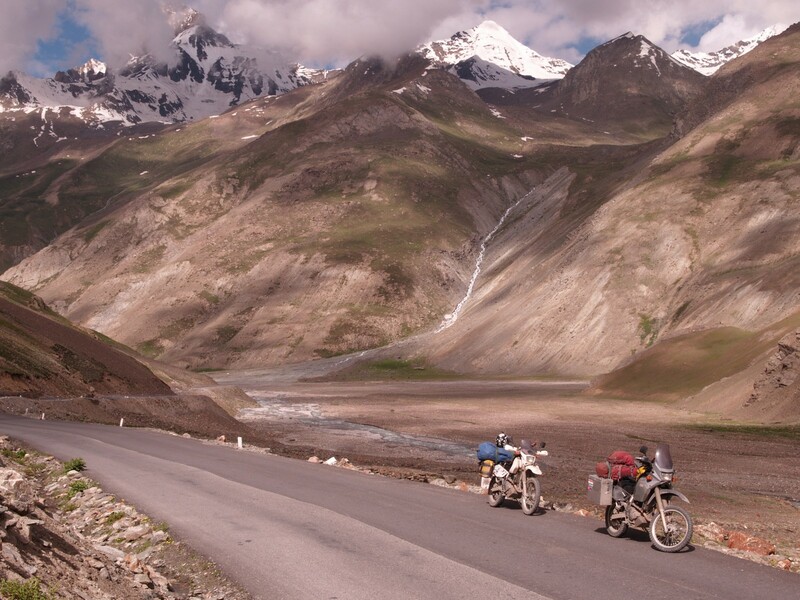 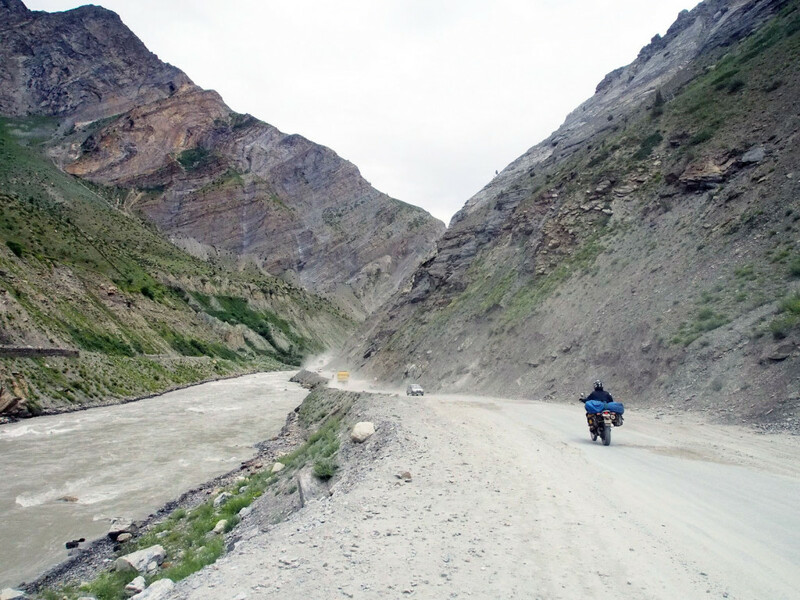 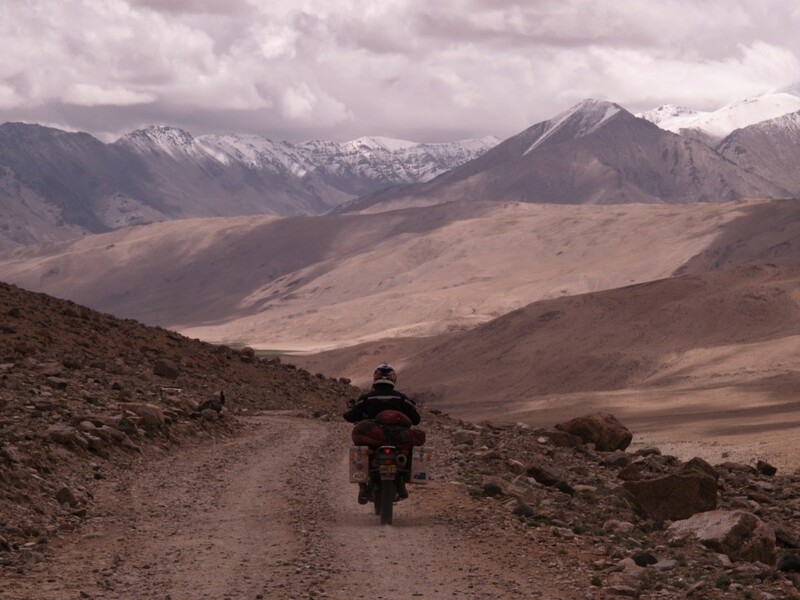 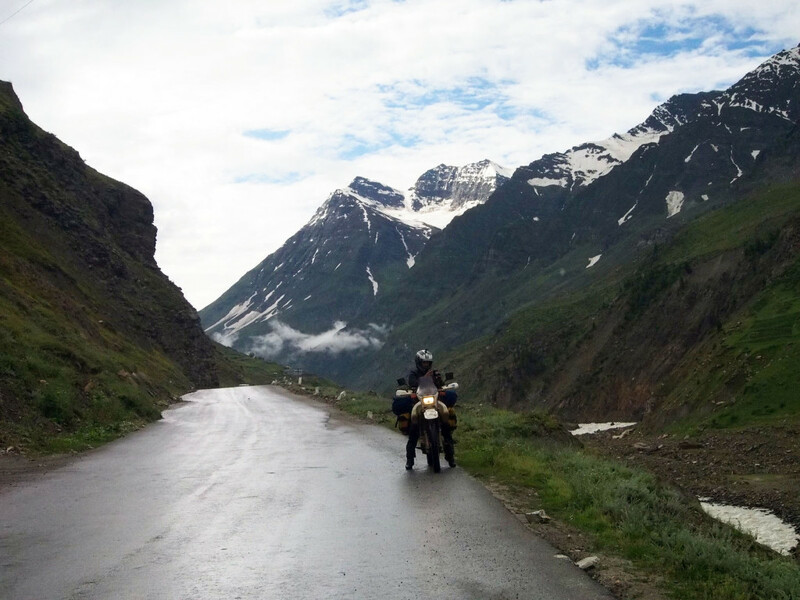 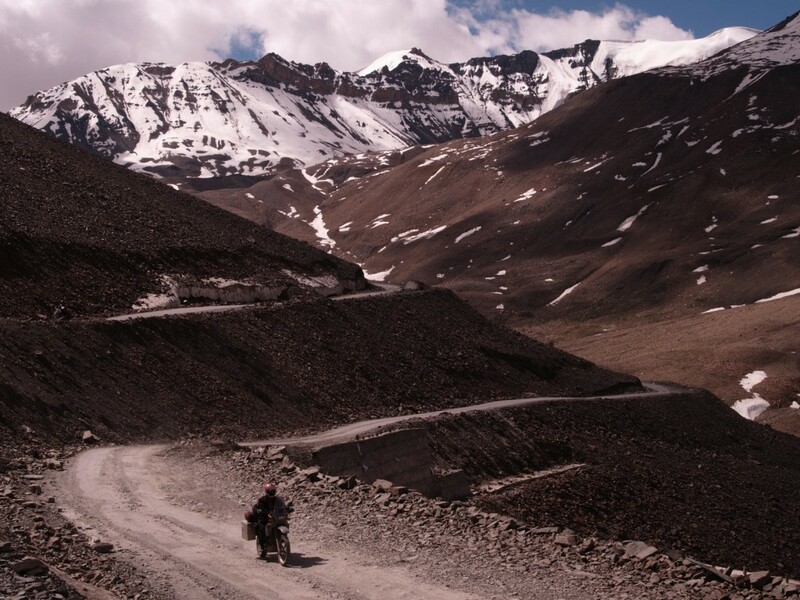 For us, the ride started at 4AM – on Tuesdays, the first pass just north of Manali closes for maintenance at 6AM, meaning a nervous hour of riding in pre-dawn darkness, with mist and rain threatening all the while. 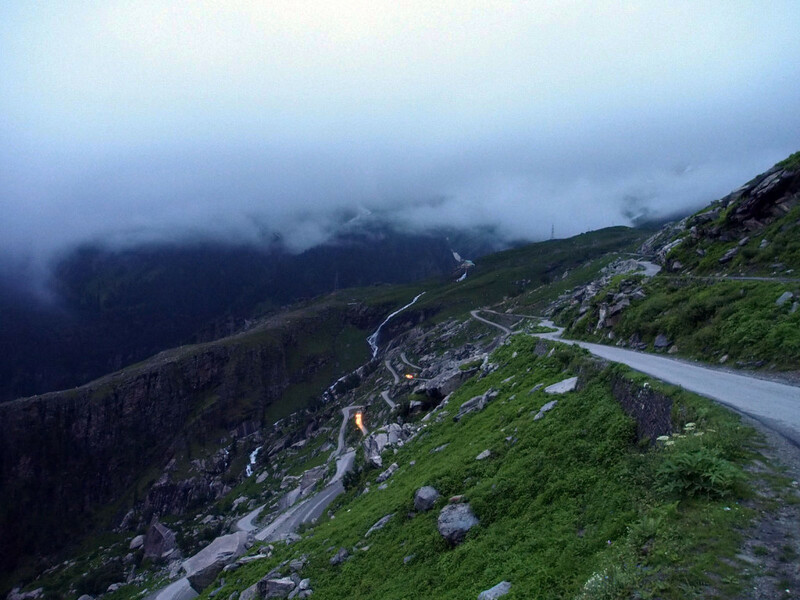 We started our ascent of Rohtang Pass just as the first light was breaking. 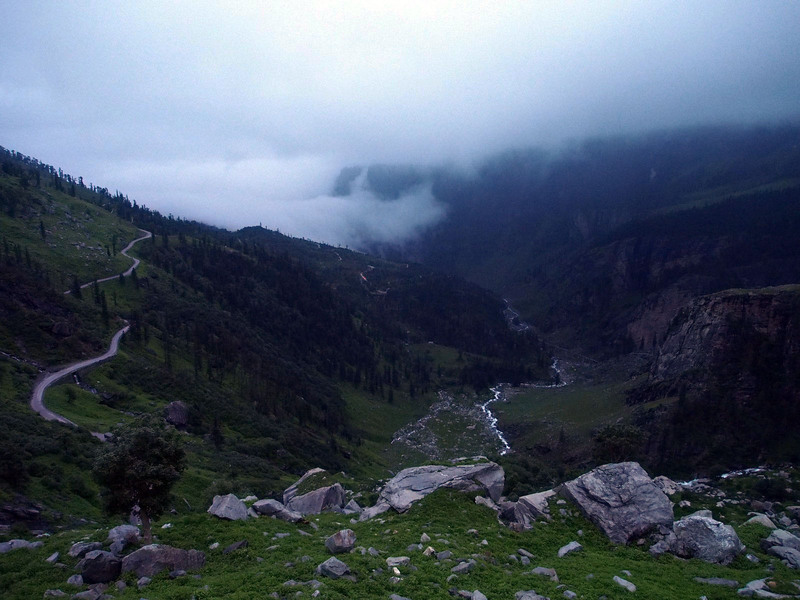 As we neared the top, the rain started in earnest, making a slow and slippery descent down the far side into a tiny river valley. 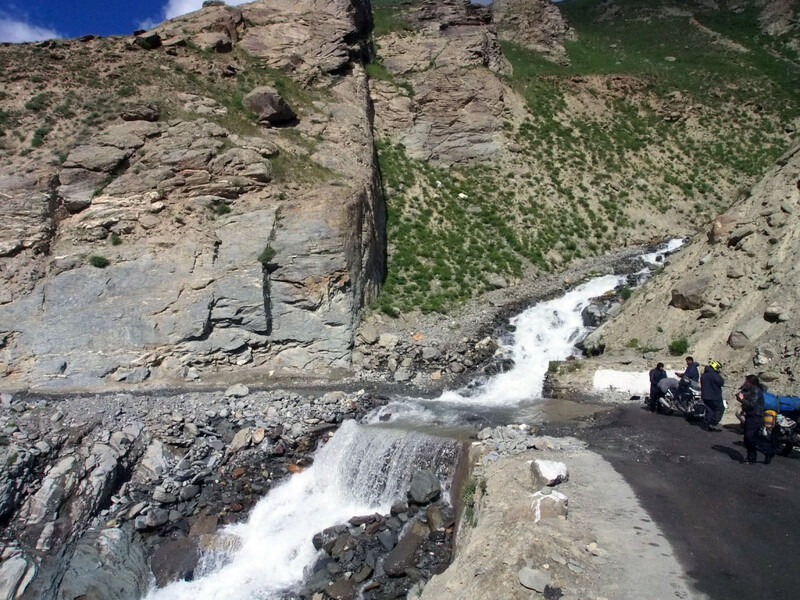 Dozens of tiny streams ran across the road – mostly just a gentle flow a few centimetres deep. 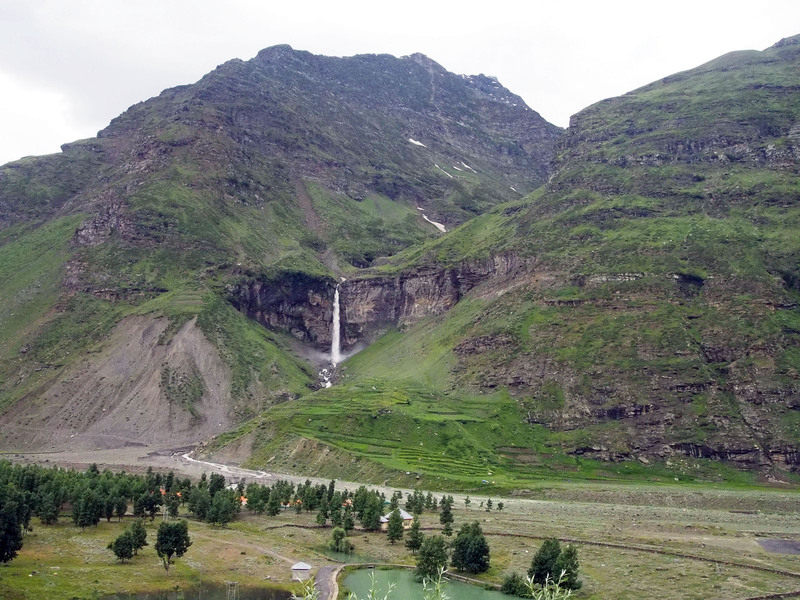 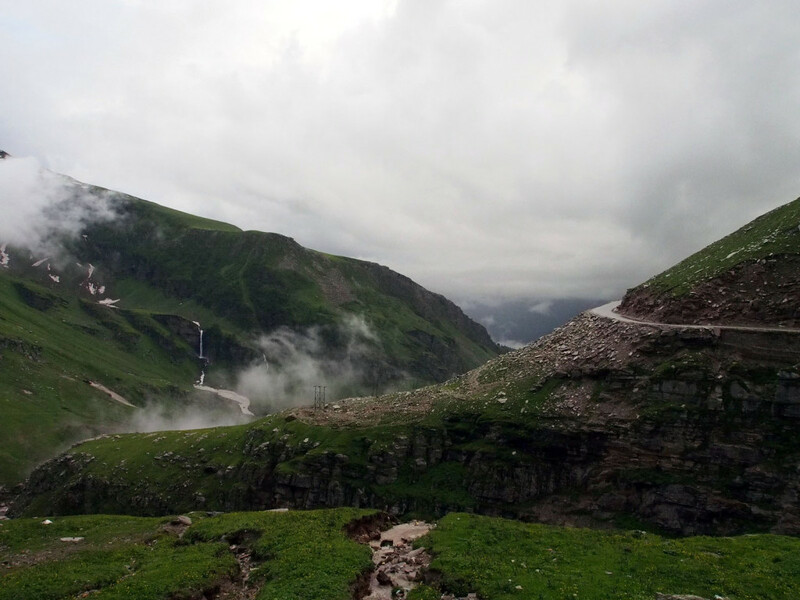 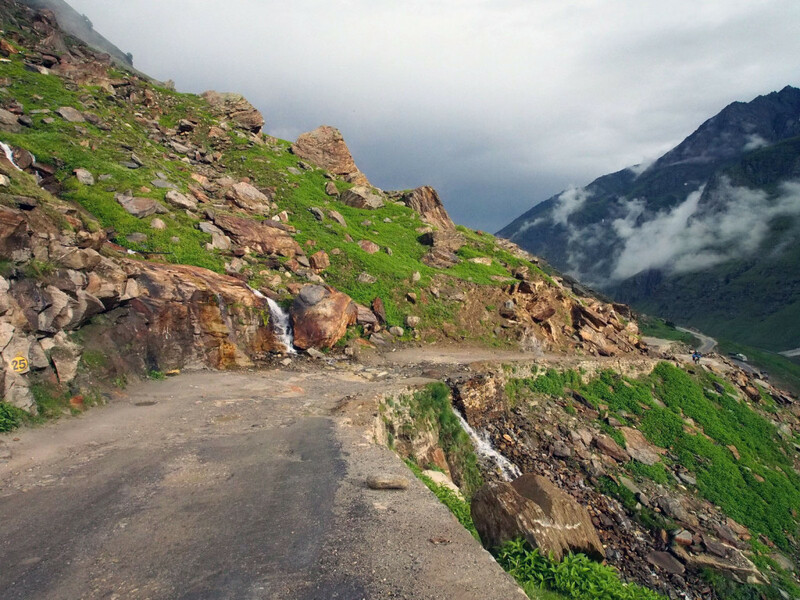 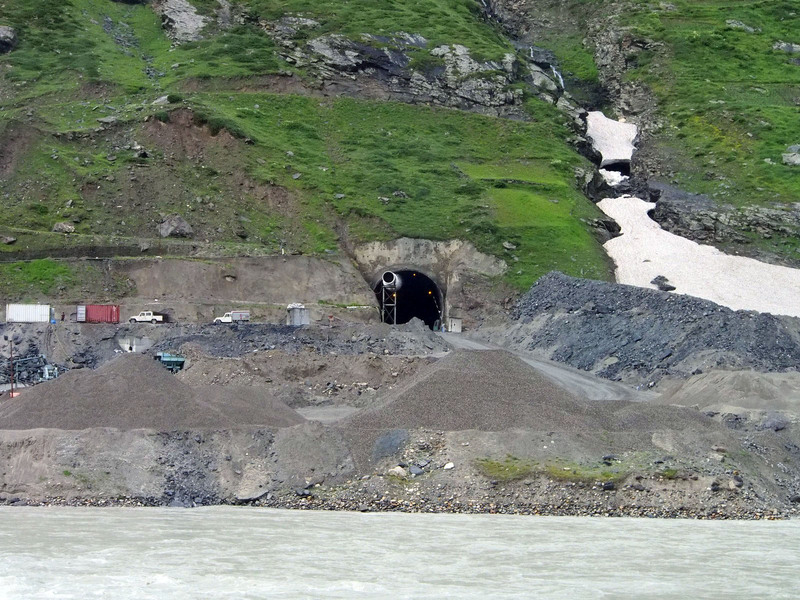 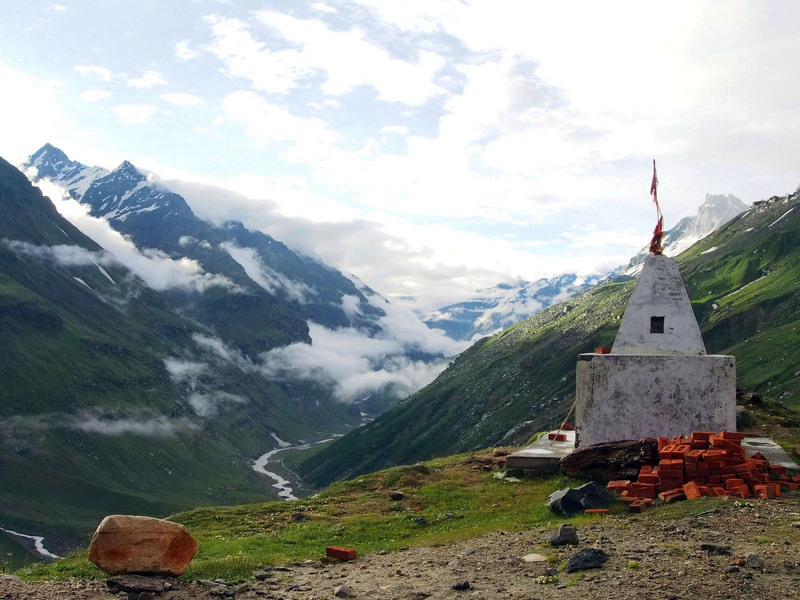 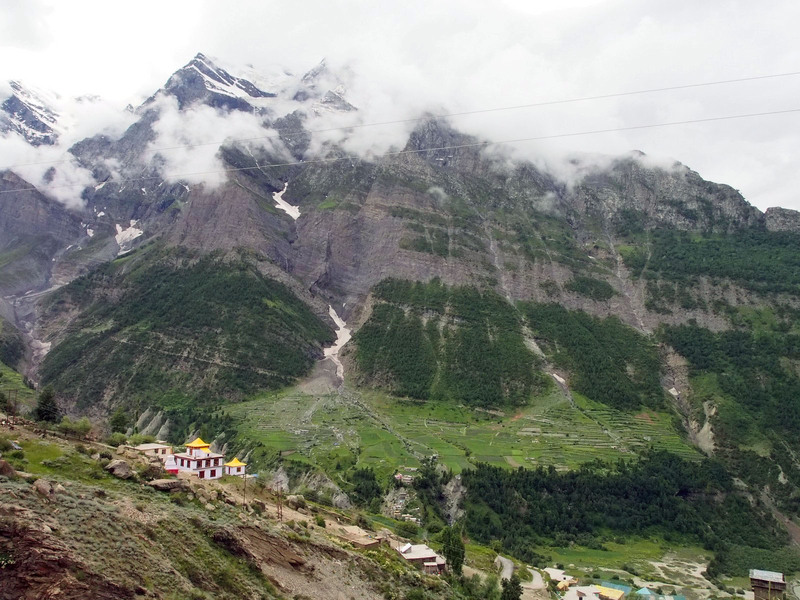 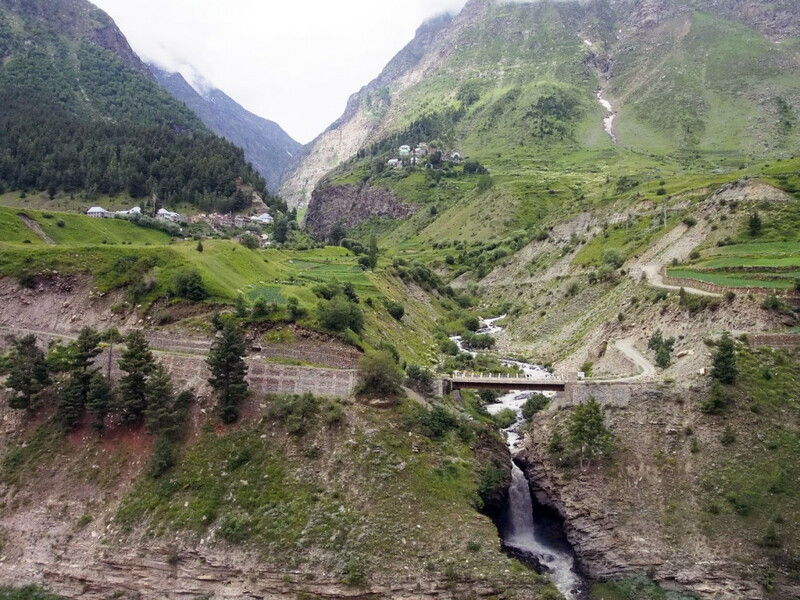 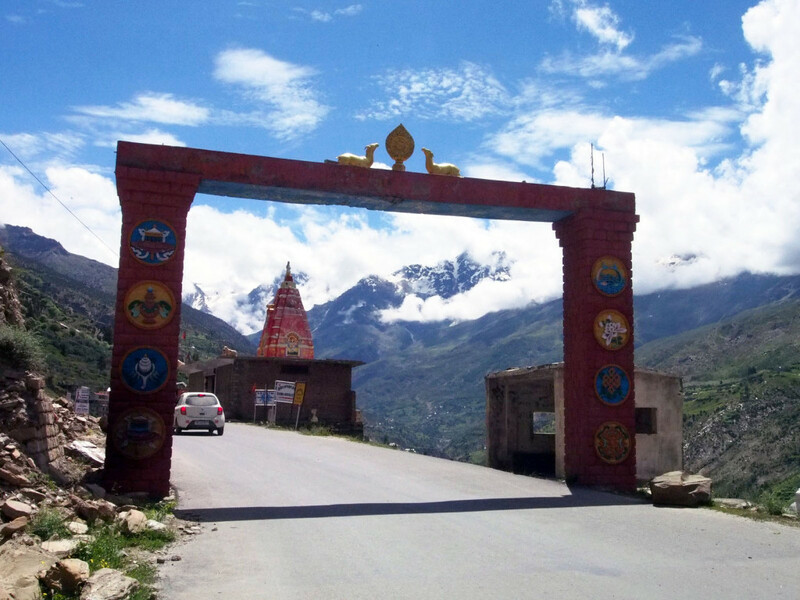 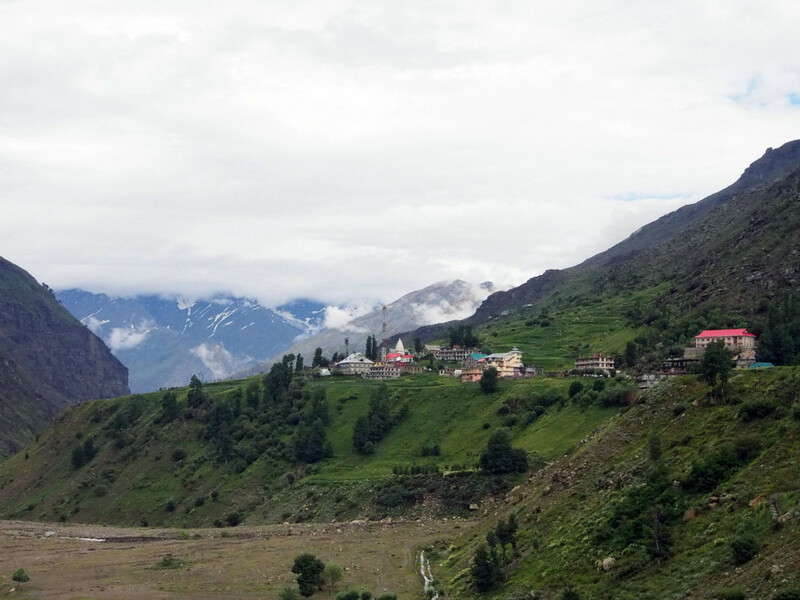 As Rohtang Pass is the one the most frequently blocked by snow and landslides, the Army are building a long access tunnel under the mountain – in a few years’ time it will be possible to bypass the first mountain range. 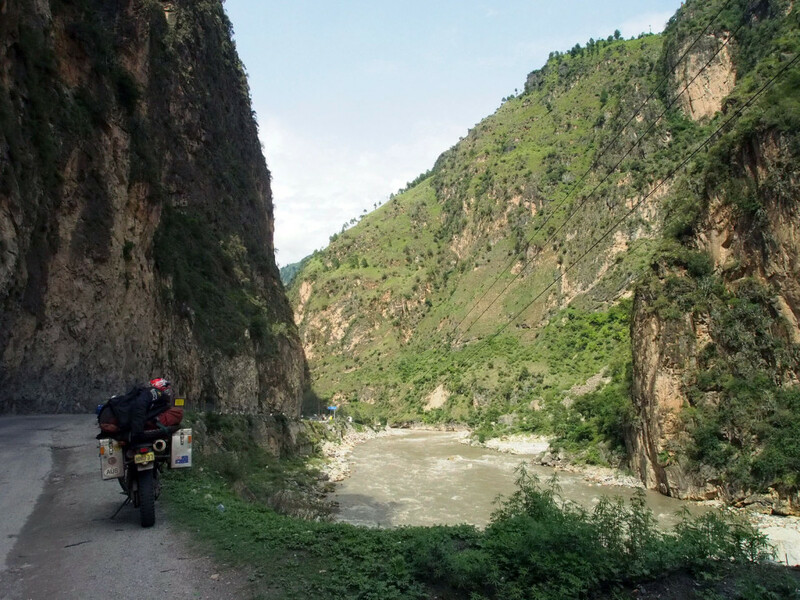 Following the river through the Lahual Valley, the road was mostly in excellent condition, winding through tiny alpine villages, with snow-capped mountains peering over lower green foothills. 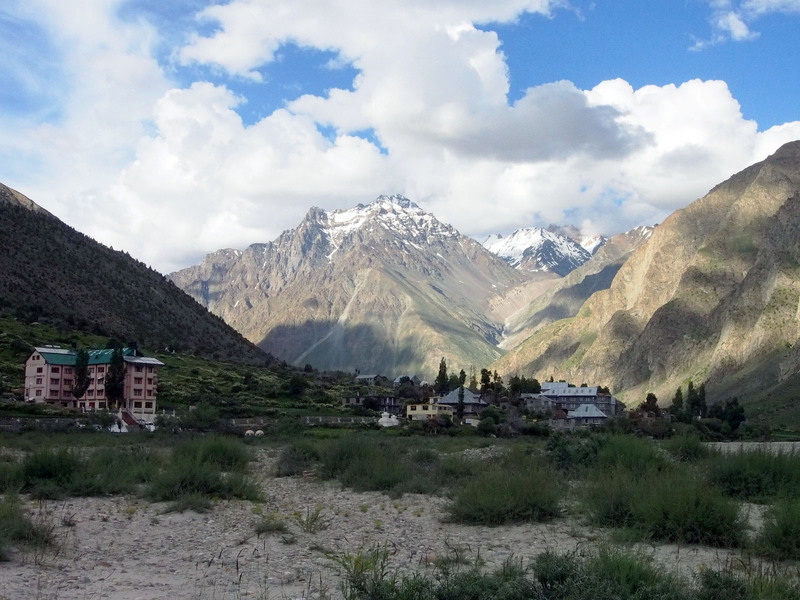 We stopped around lunchtime at the small settlement of Jispa – in terms of acclimatisation to altitude, it’s the last stop under 3000m. 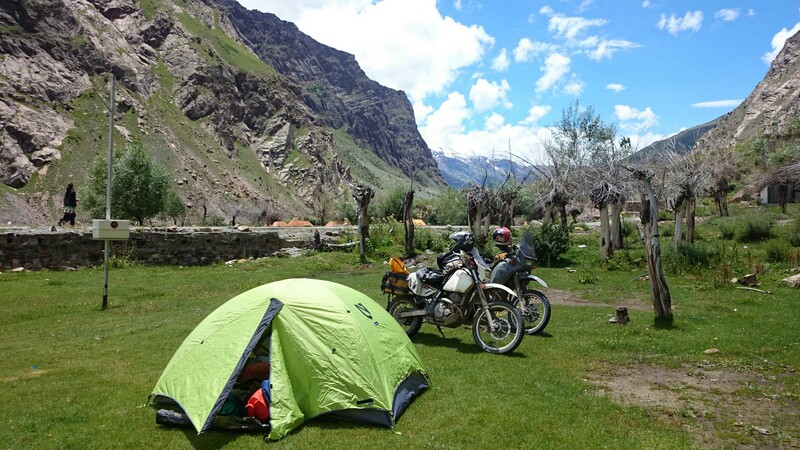 We set up our tent (first time it’s been used since leaving Australia! 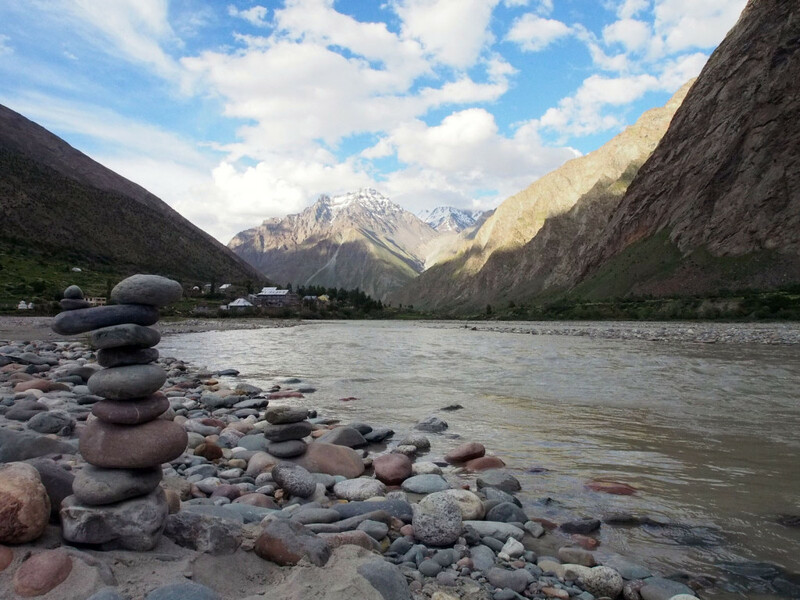 ), and wandered down to the riverside, where I followed the local custom of piling up stones. 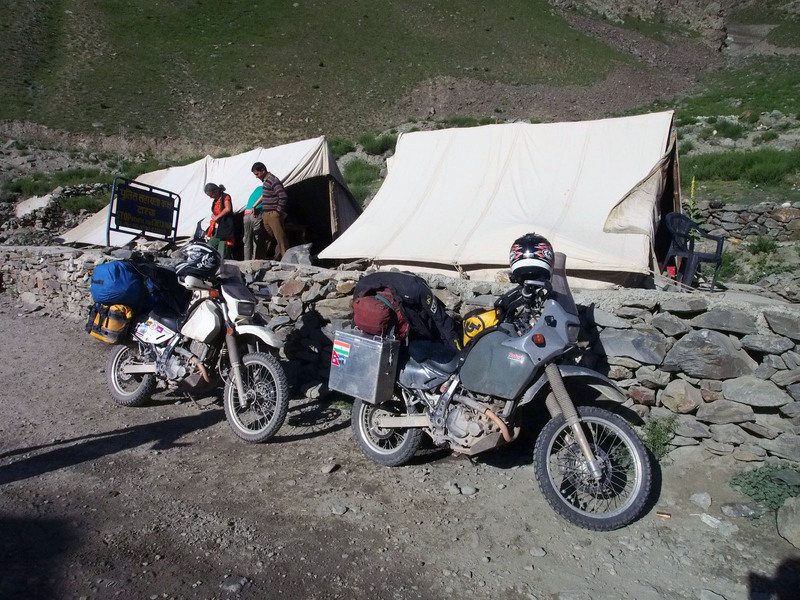 Later that afternoon we met a group of French tourists on rented Enfields, who we would cross paths with many times on the rest of the way. 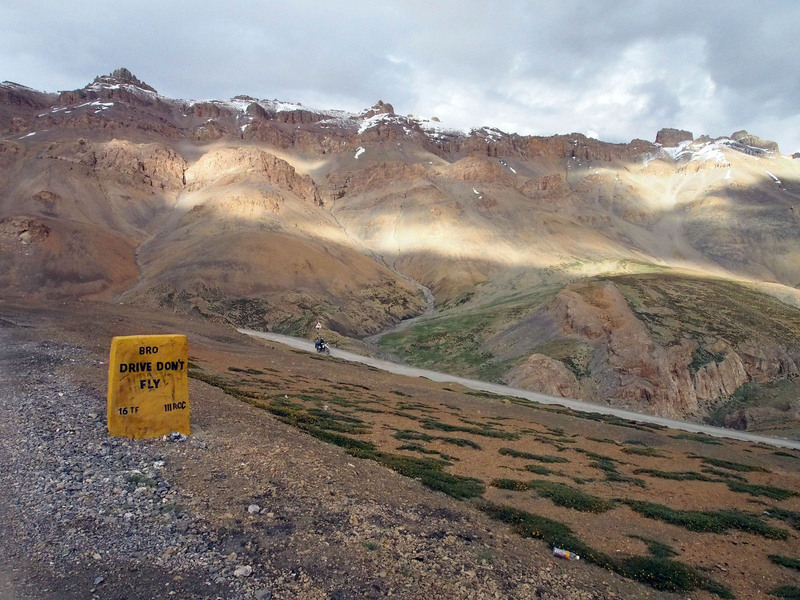 An early start the next morning was almost immediately interrupted by a police check – there are a number of these posts along the road, where a bored policeman will laboriously copy down your details in a ledger before letting you pass. 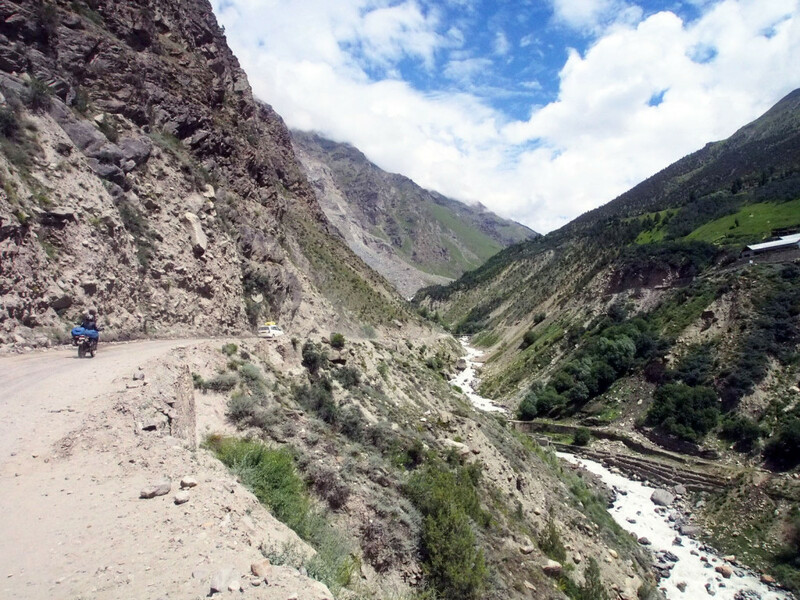 The road followed the same river valley as before, however the shallow streams across the road were replaced by some monsters – this one in particular was difficult to cross even on foot, and threatened to sweep the unwary over the edge of a cliff! 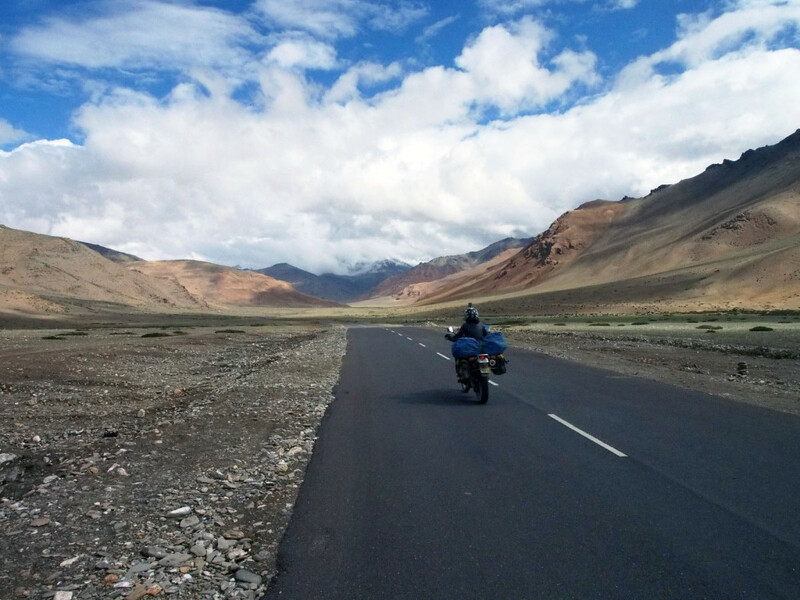 It took a fair run up and a wide open throttle to clear it. 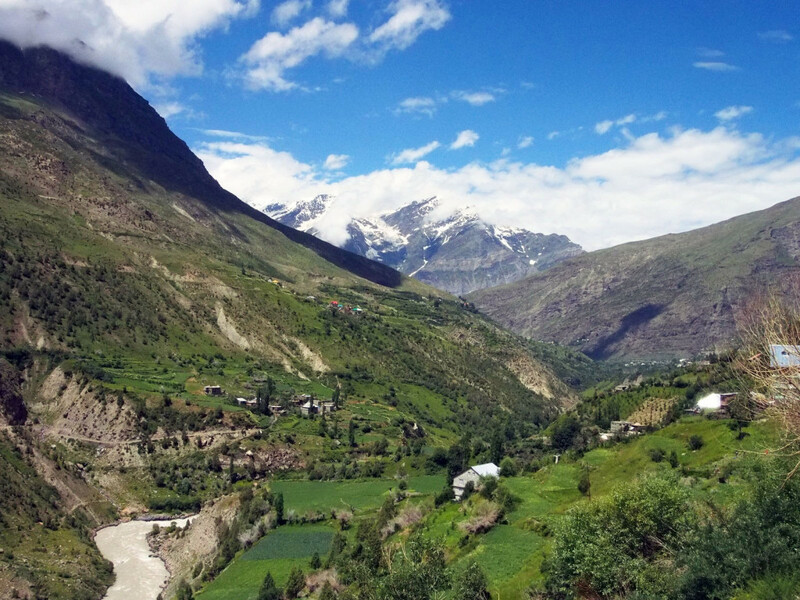 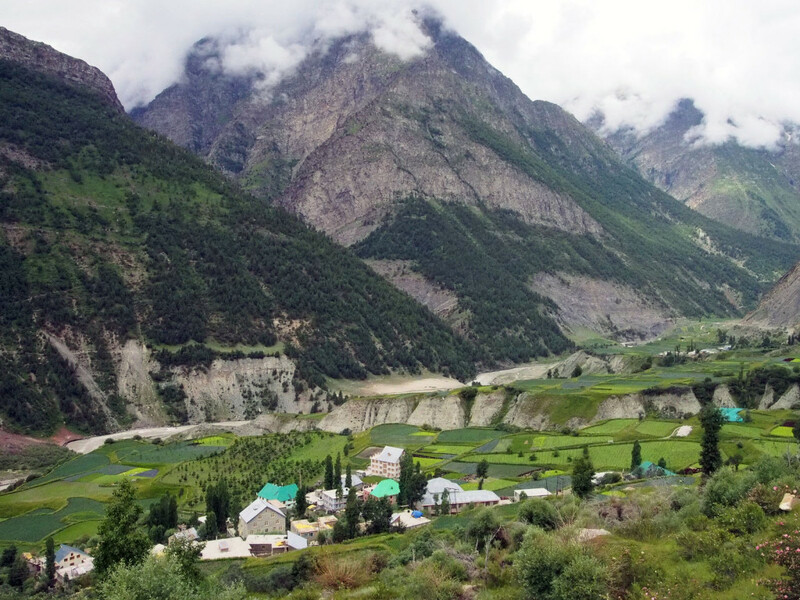 We were still in the lower parts of the Himalayas, so not completely in the rain shadow – thus the land was often still green and verdant, although the rockier alpine desert started to appear as we continued. 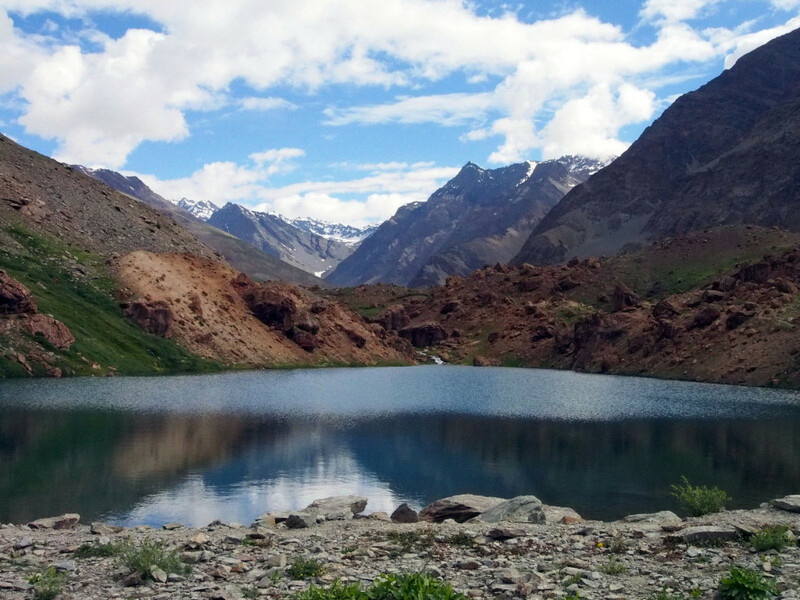 Small alpine lakes had incredibly clear water, fed by streams of snowmelt. 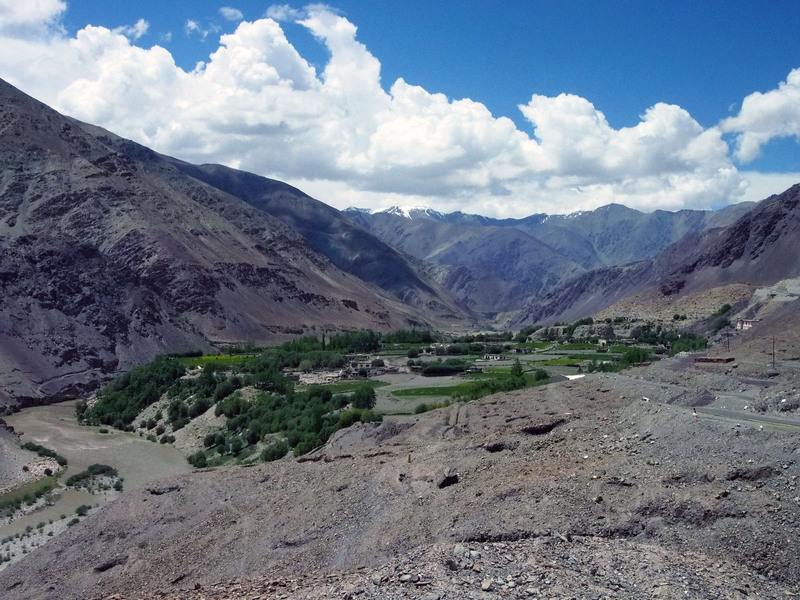 The first of three passes for the day, Baralacha, was just a gentle ascent. 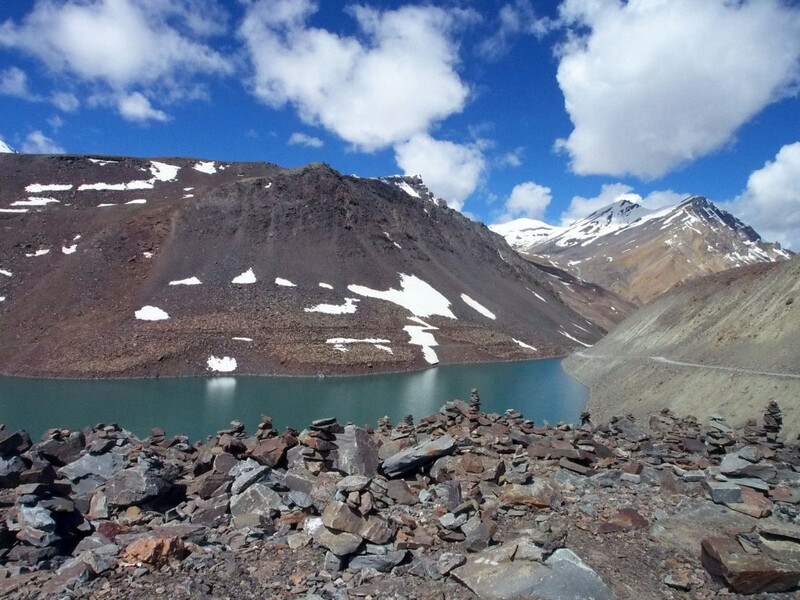 From here we wouldn’t descend below 4200 metres for the next 36 hours. 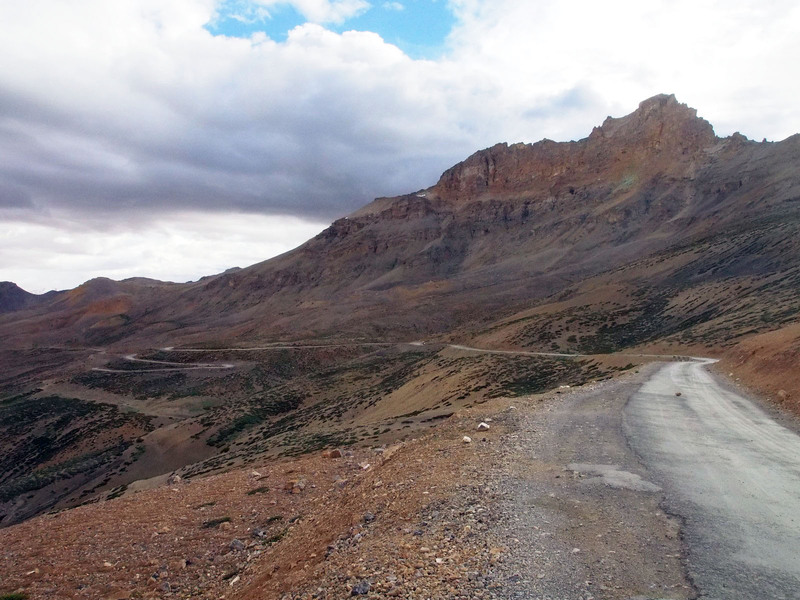 The rocky aspect of the plateau was now evident, the road surface rough but manageable. Small flocks of sheep, tended by leather-faced locals, roamed the plain. 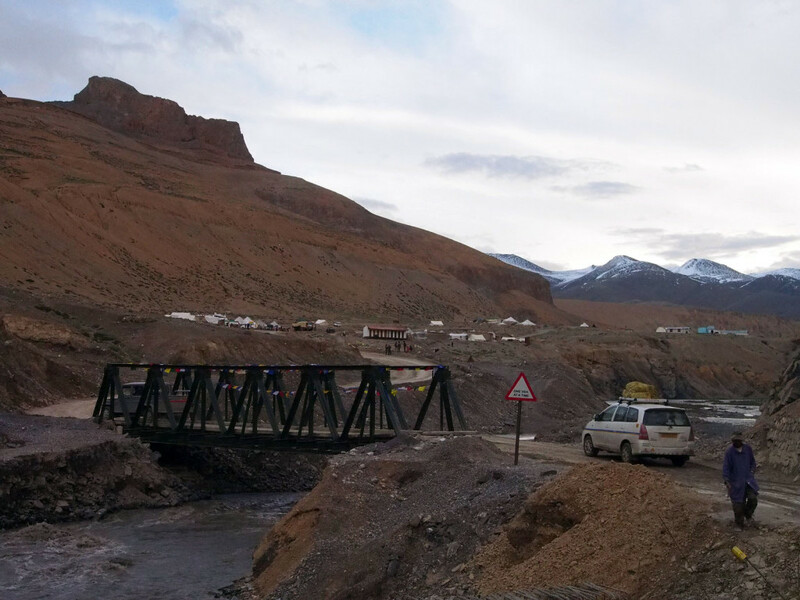 Just after the tiny temporary camp at Sarchu (basic food and rough beds only), we came up behind a long line of trucks parked on the side of the road. 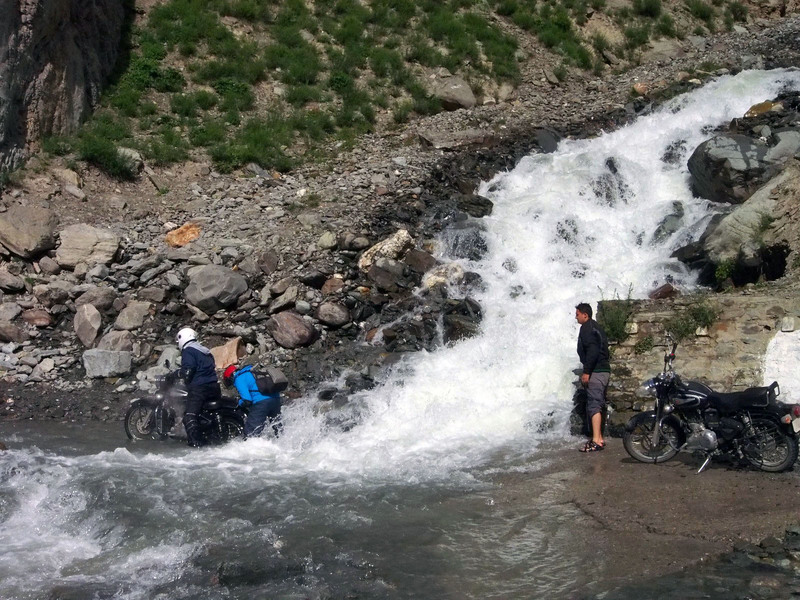 Riding forward, we saw cars and bikes also pulled over, before one of the many Army bridges. 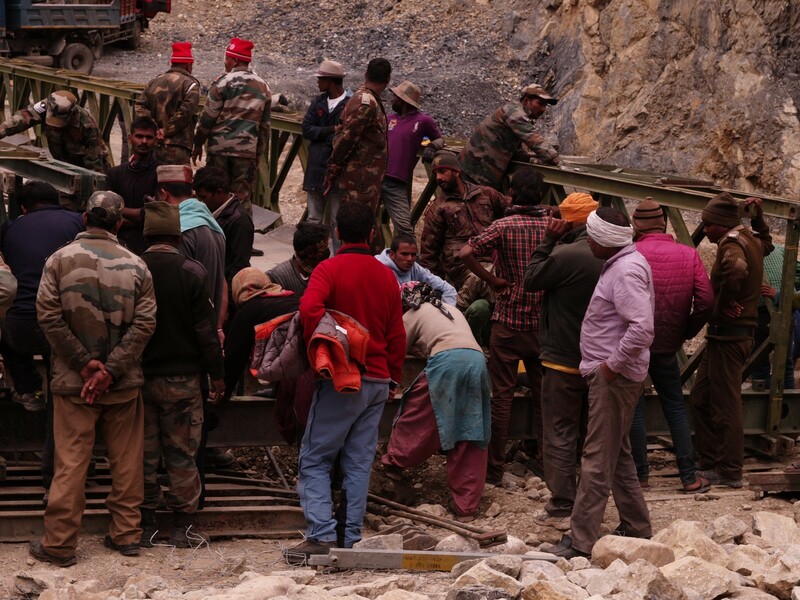 Stopping to ask a group of Danish guys on Enfields what had happened, we learned the bridge had been damaged. 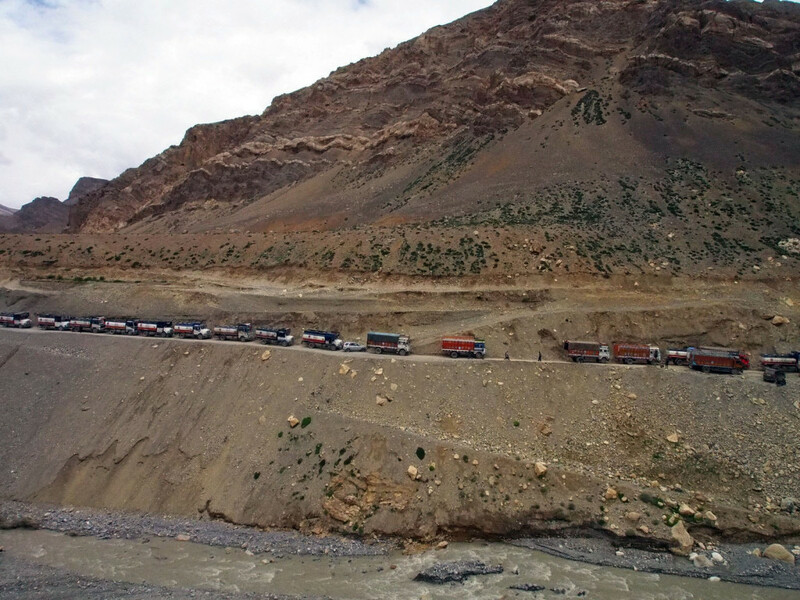 They had been there five hours already, but some of the trucks had been stuck for four days. 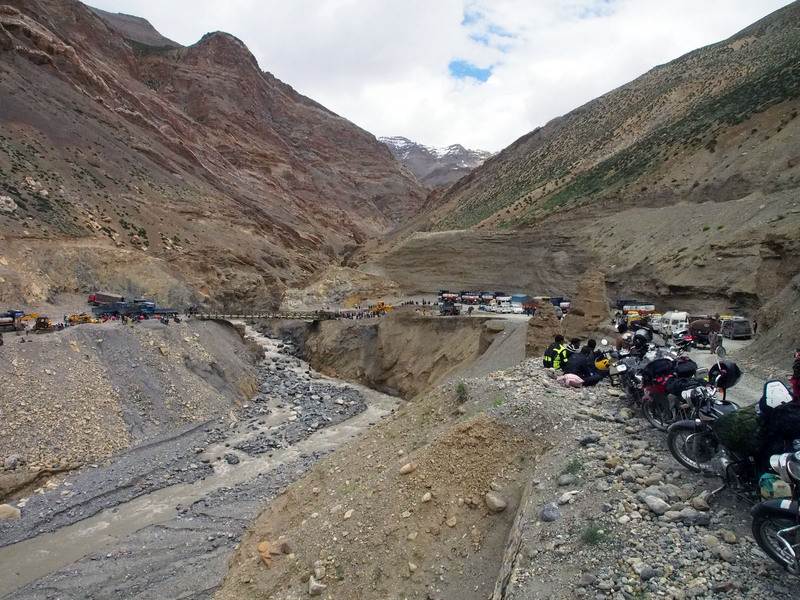 We waited another three and a half hours until the temporary repairs were complete, and joined a stampede of riders getting across before they closed it again for further work. 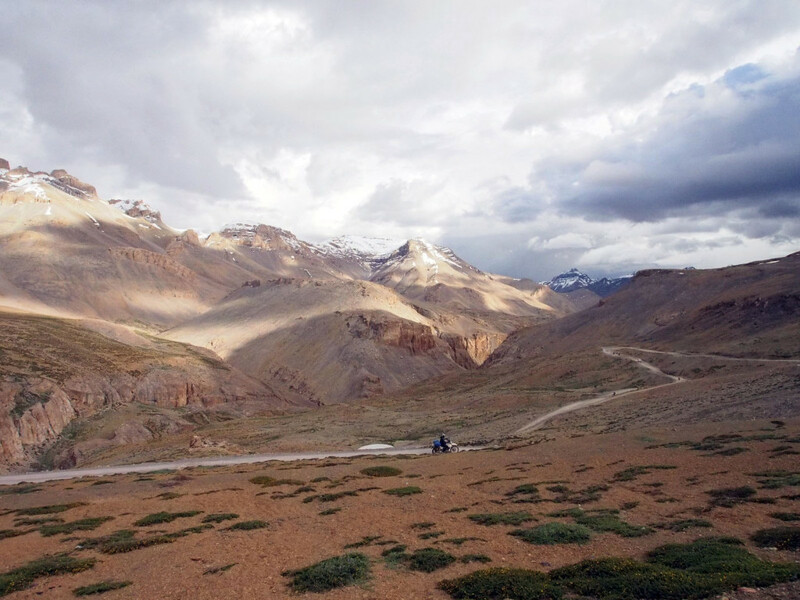 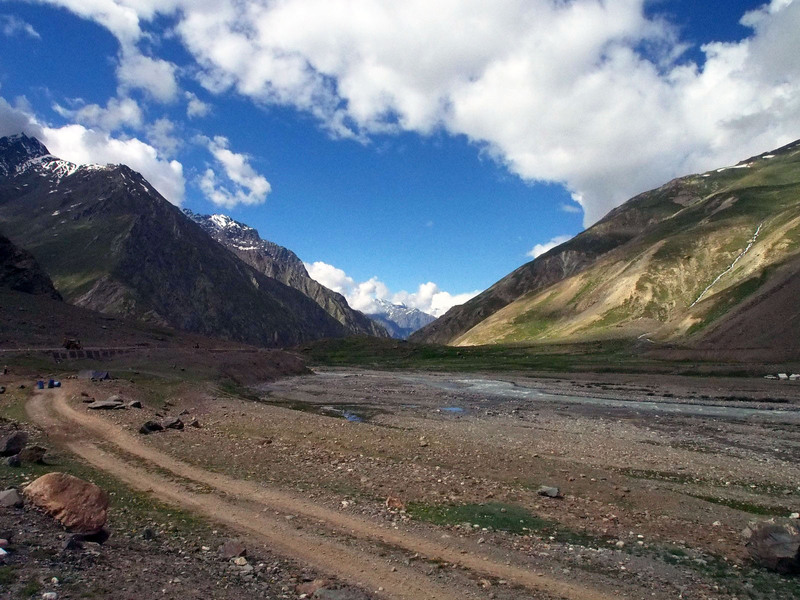 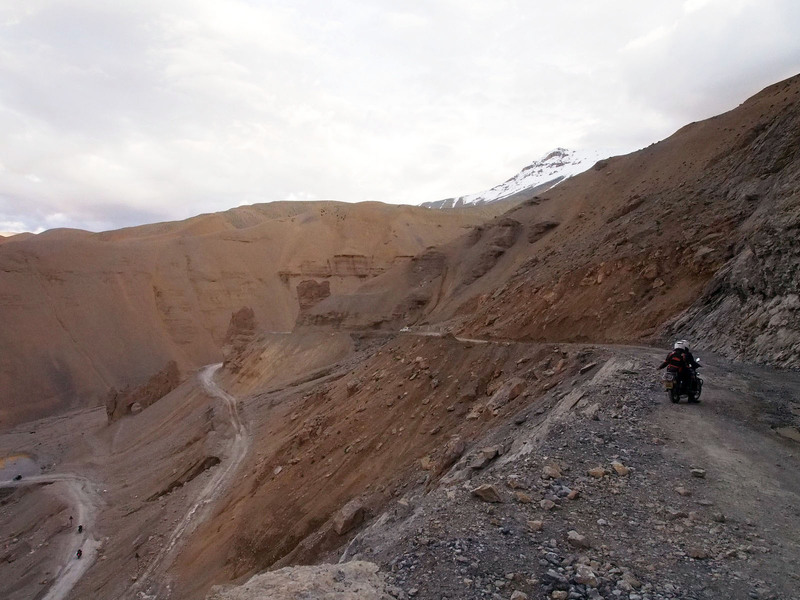 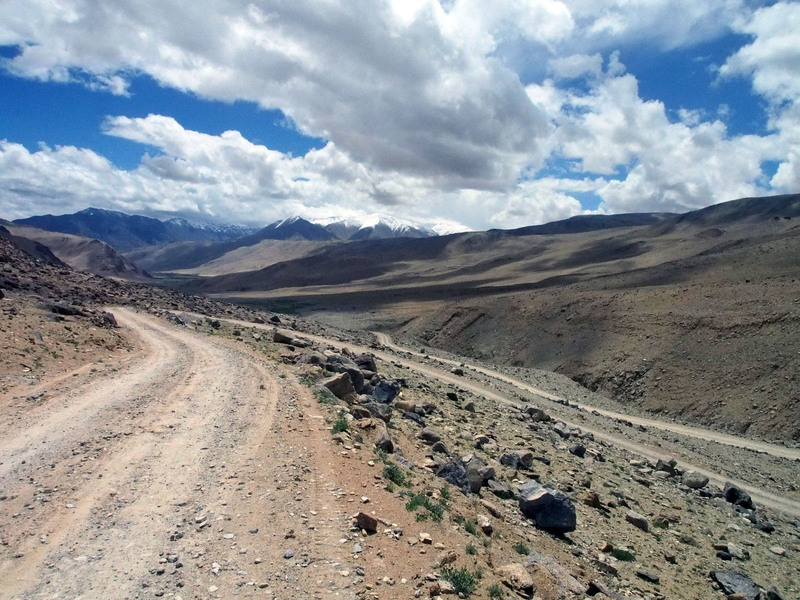 We now climbed towards two of the highest passes on the highway, through a desolate but striking landscape. 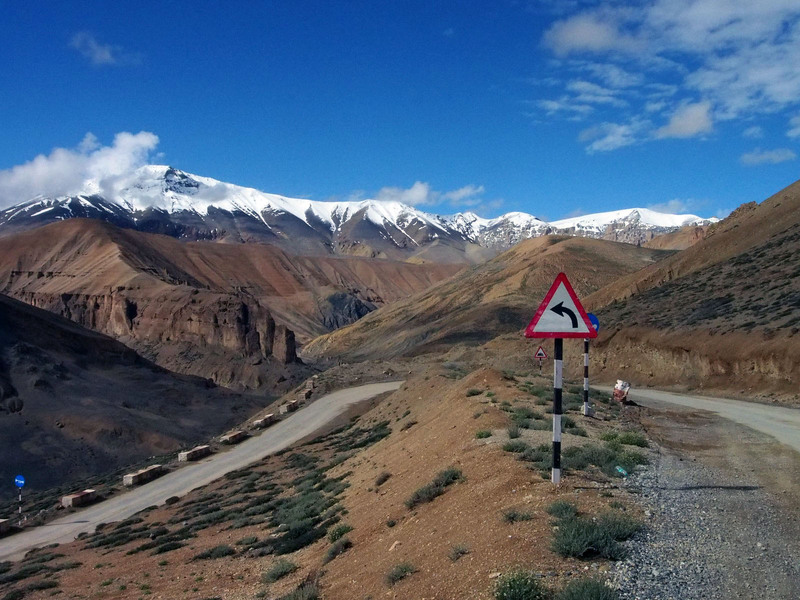 With no safety barriers and only a lane and a half’s width, it would take several minutes before you reached the bottom if you went off the edge. 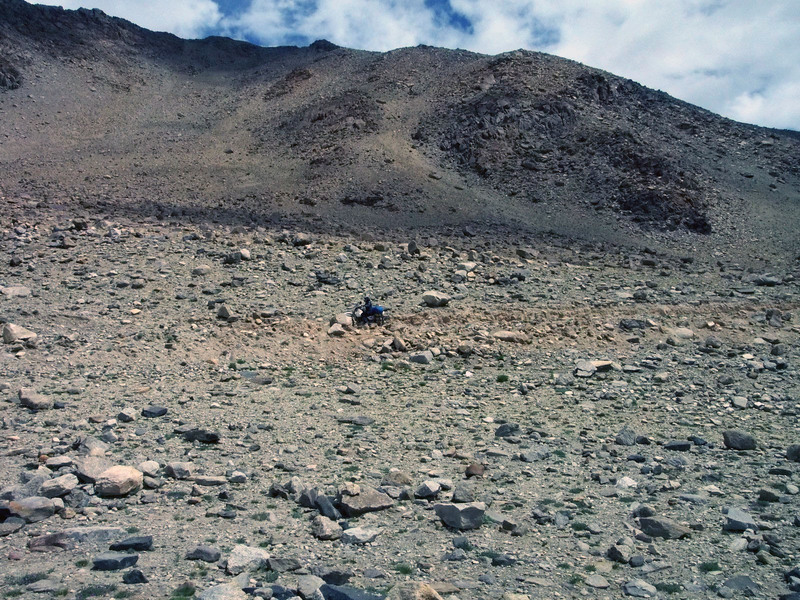 That last pass is just over 5,000 metres in the new money, and verified by my GPS at 5046m. 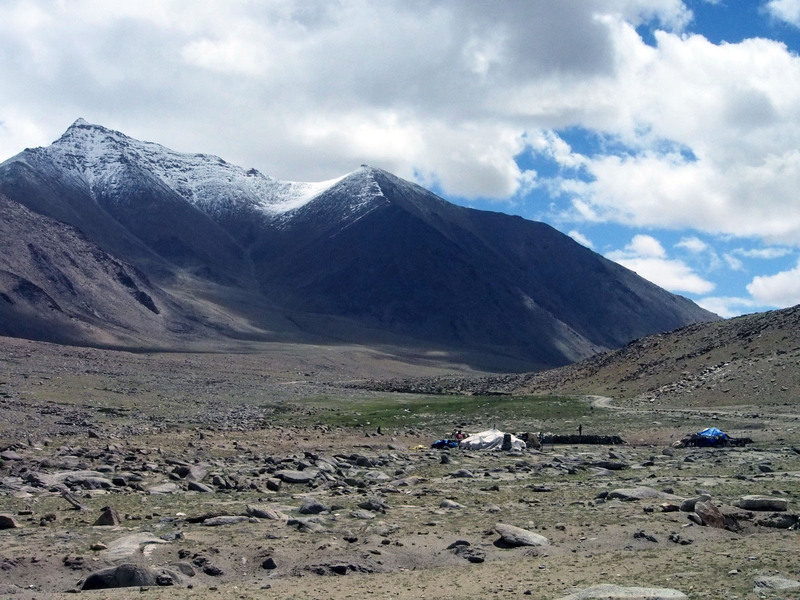 With darkness approaching we passed through what looked like mountains of sand, to the encampment of Pang. 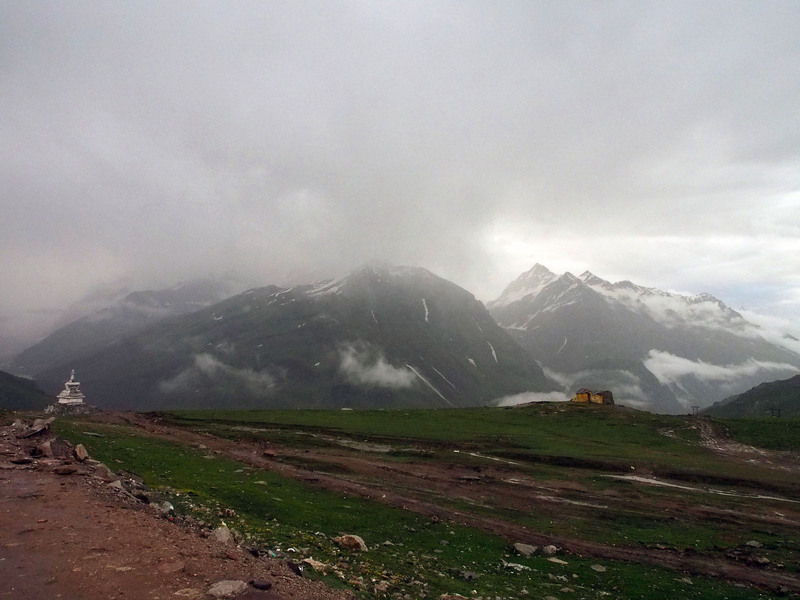 Rumours of a major road blockage ahead, combined with an oncoming thunderstorm and the promise of hot food, helped us decide to stop for the night. 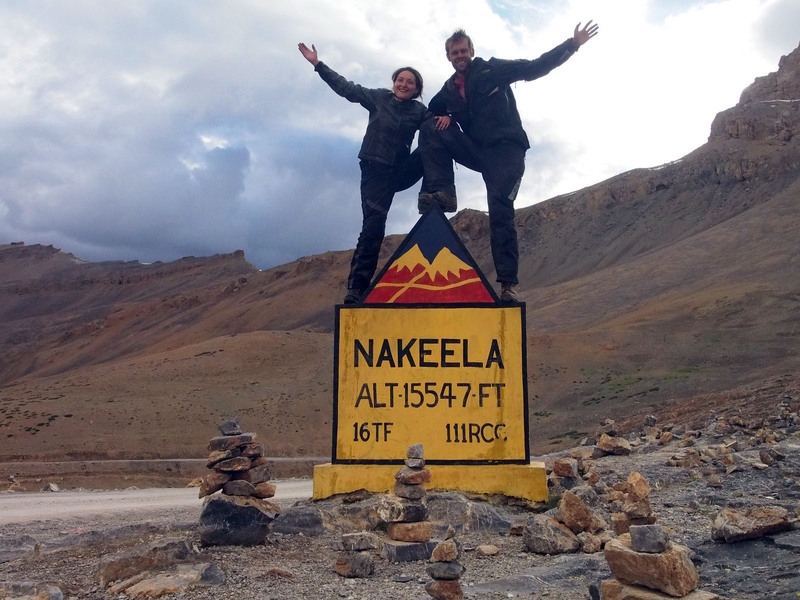 Not a terribly restful night at 4,480 metres altitude, but we both avoided any serious symptoms of altitude sickness. The next morning, we asked around for opinions on the road ahead. 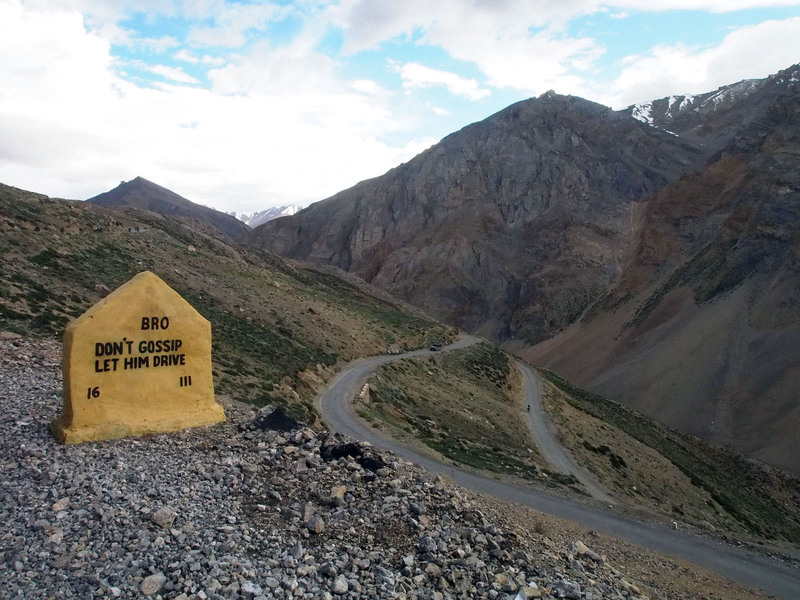 The general consensus was that the main highway was blocked for at least a week at the next pass, but there was a side route that could be taken. 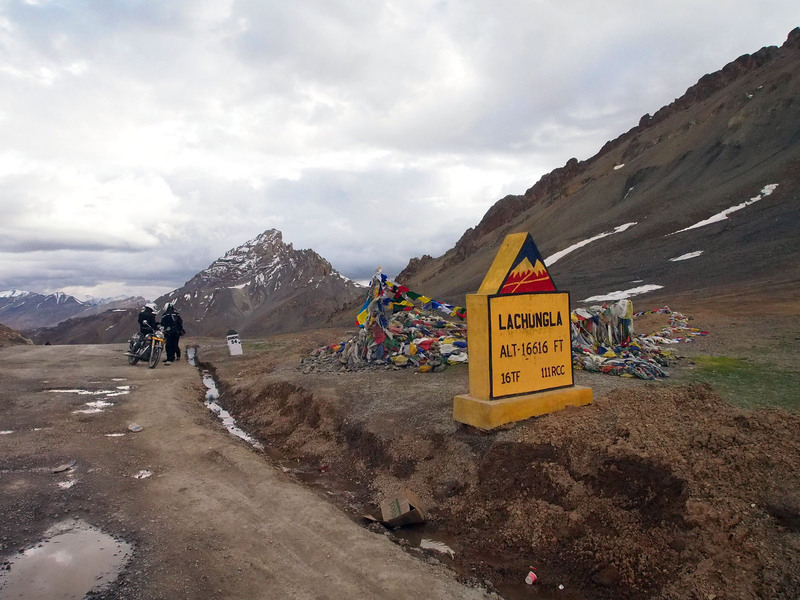 The problem with this, however, was fuel – it is already 365 kilometres between fuel stations on the main road, the extra loop would add at least another 120, and fuel economy was worse than usual with the altitude, difficult terrain and steep gradients. 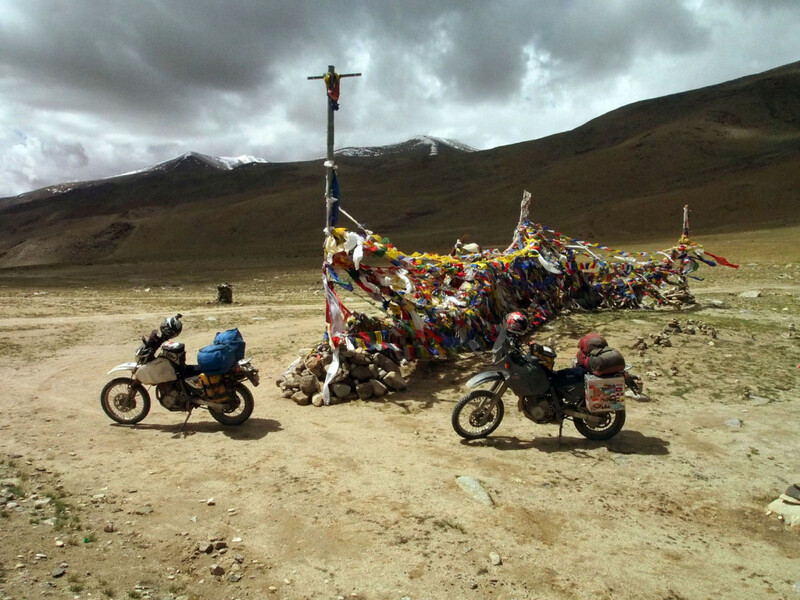 We seriously considered turning back, to be sure we didn’t run out of fuel, but after asking around literally every food tent there, we managed to find a 20L jerry of petrol. 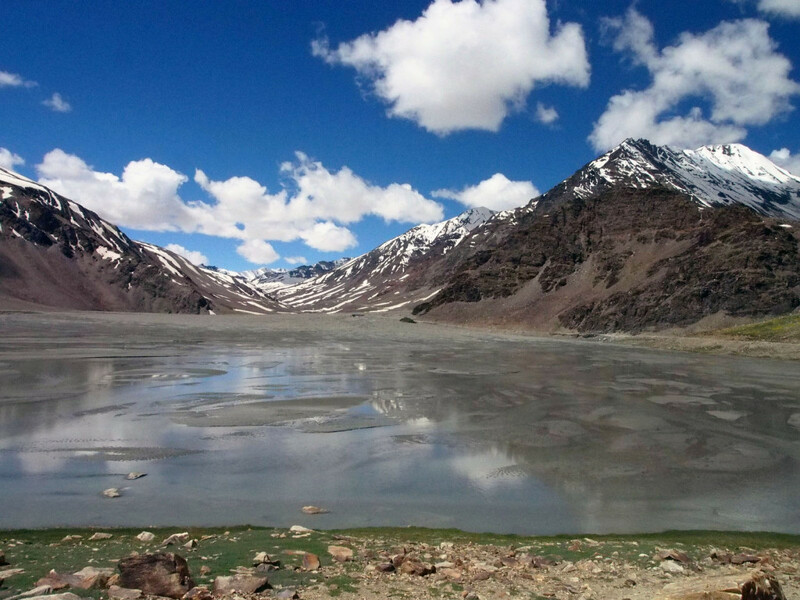 Hugely overpriced, but it gave us the confidence to still reach Leh despite the extra distance. 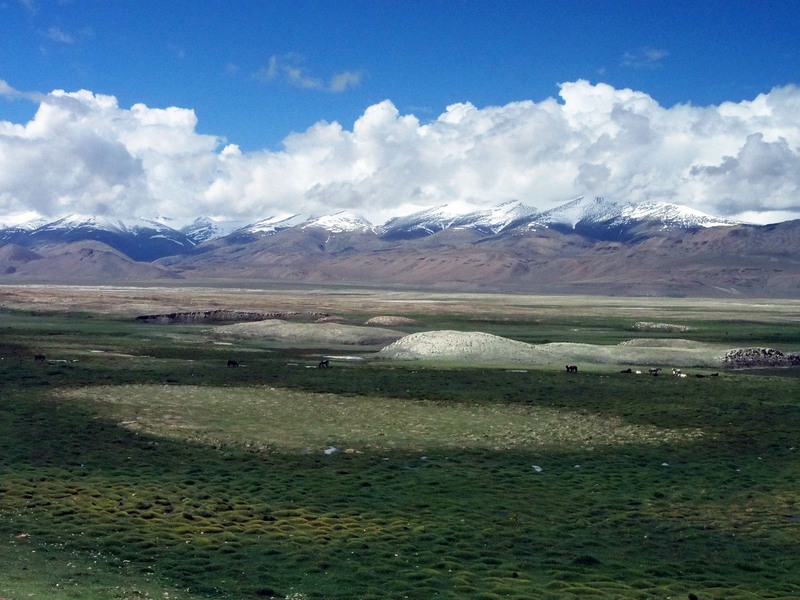 After a quick run up the hillside, we entered a vast open plain, ringed on all sides by towering mountains. 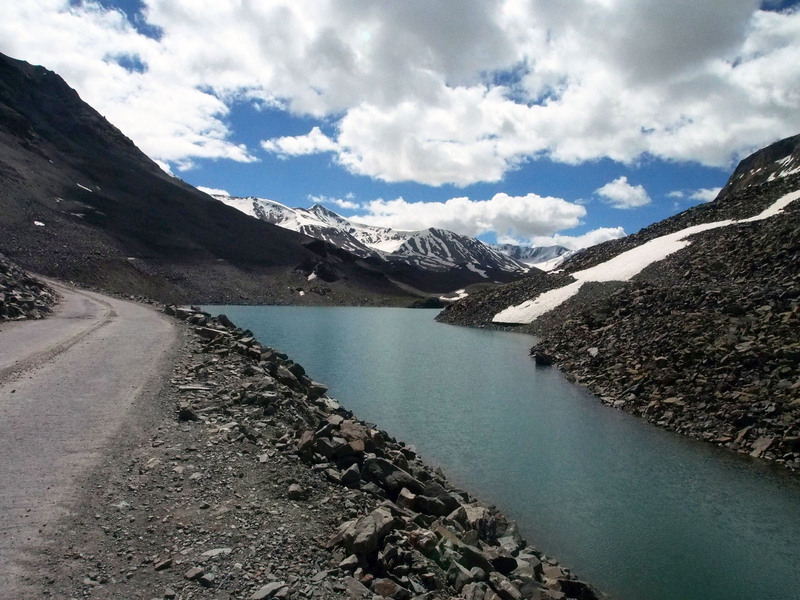 Soon, we turned off the main highway onto the side road, passing by another alpine lake. 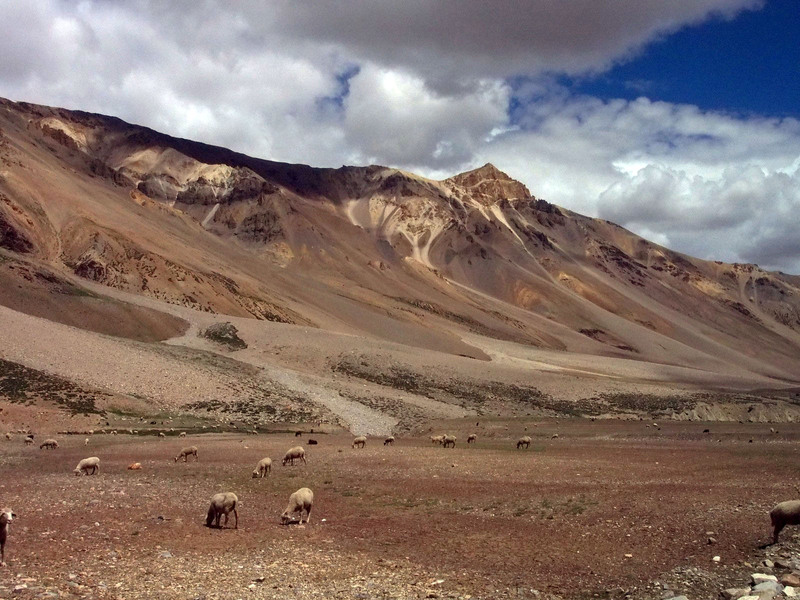 Then, approaching yet another pass, the road got rocky and rough, passing by some nomadic encampments. 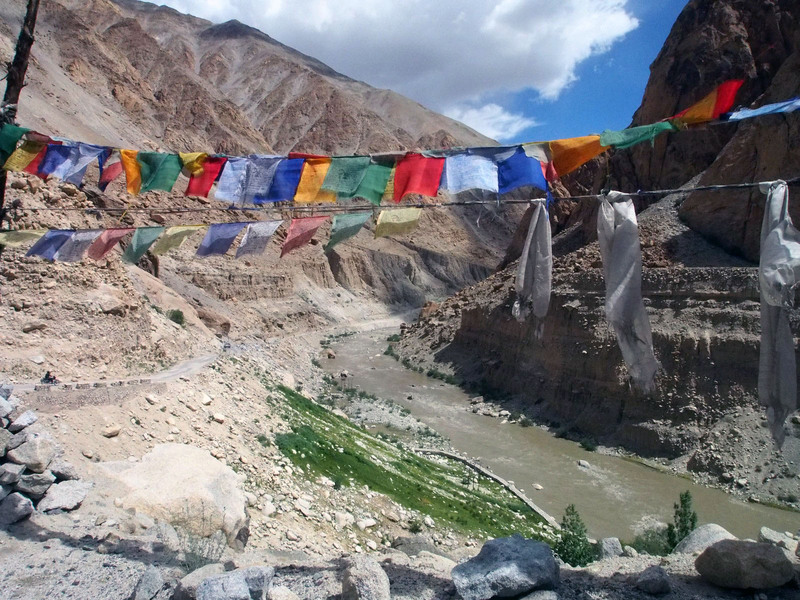 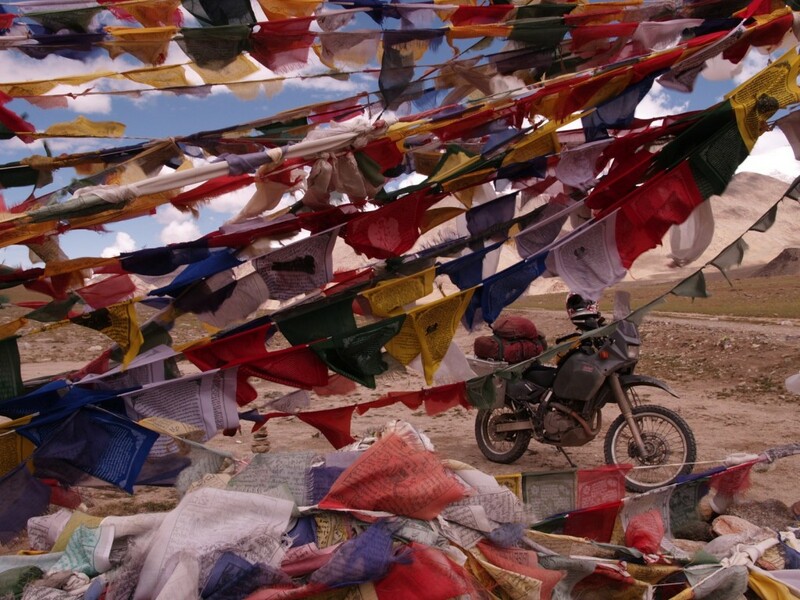 The top of each pass is marked by a large collection of Buddhist prayer flags and piles of stones. 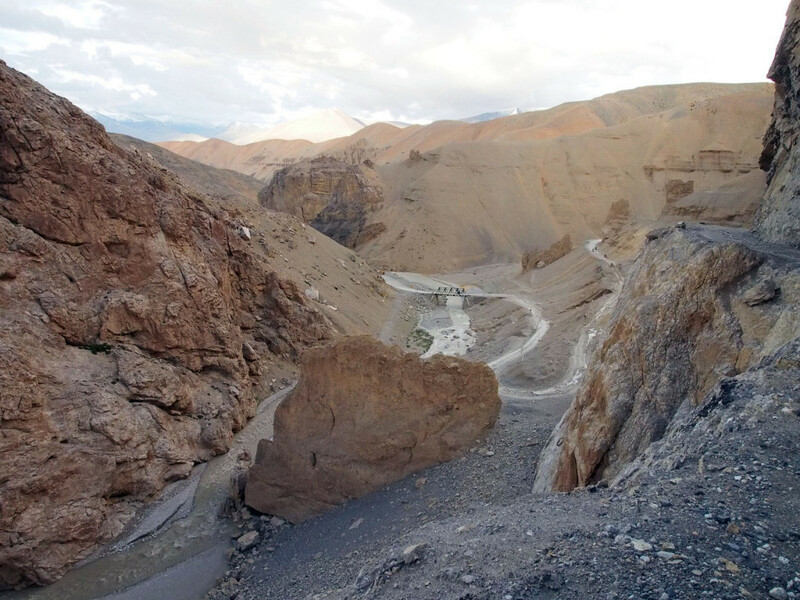 Descending again through the rocky, almost lunar landscape made us wish for smooth bitumen – a wish that was actually granted once we reached yet another small river, raging swiftly in a confined canyon. Passing through a police checkpoint, they were annoyed that we didn’t have the relevant permits to be on this road – however since this was the only open route between Manali and Leh, and by the looks of the ledger dozens of foreigners had already been through that morning, they let us continue without much argument. 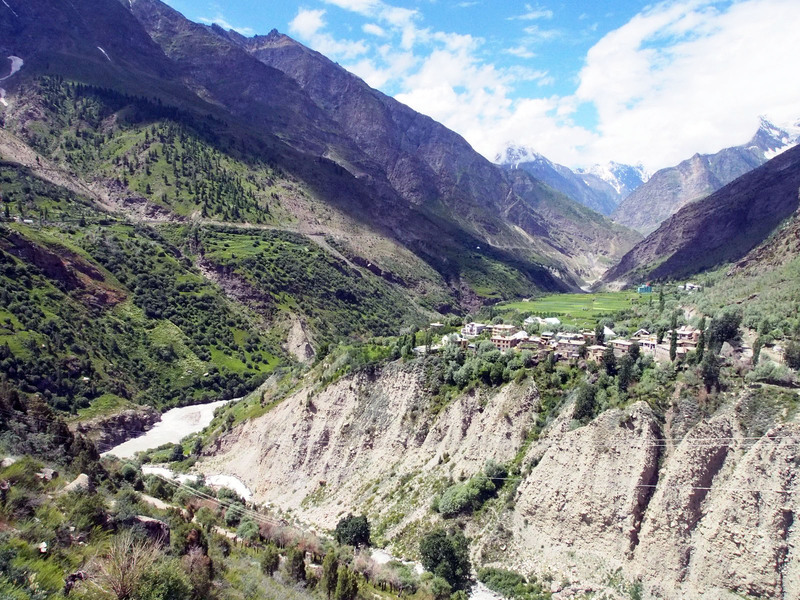 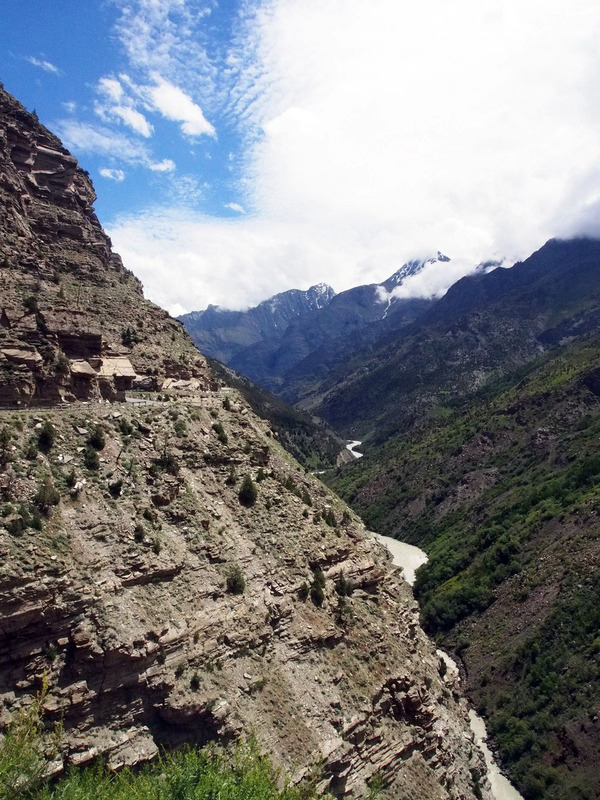 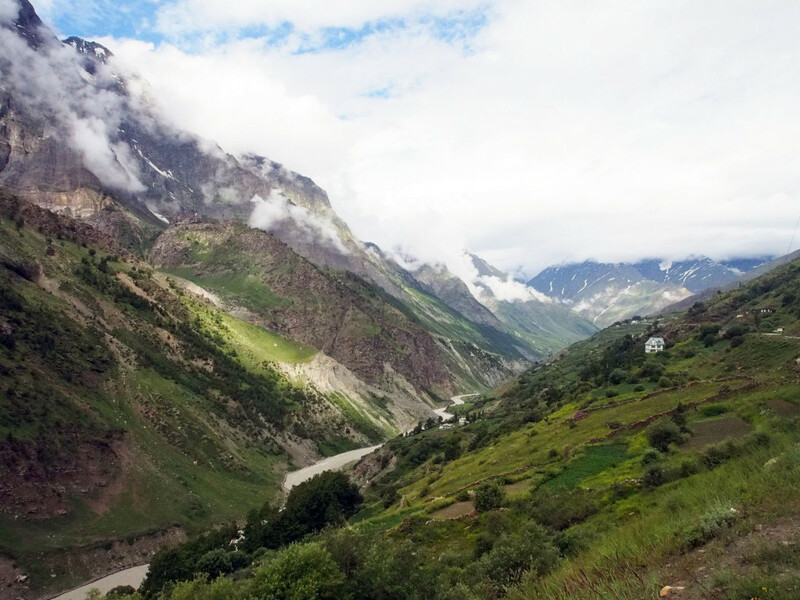 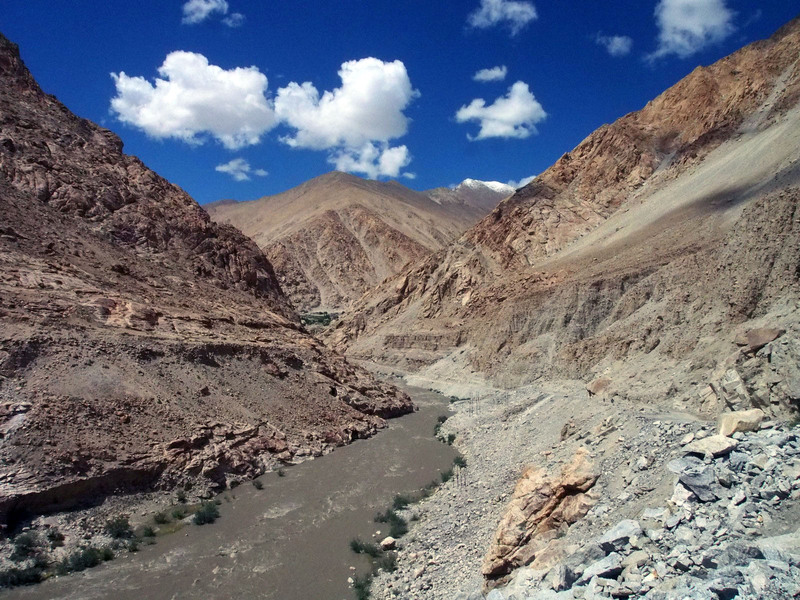 We were now following the Indus River along its valley. 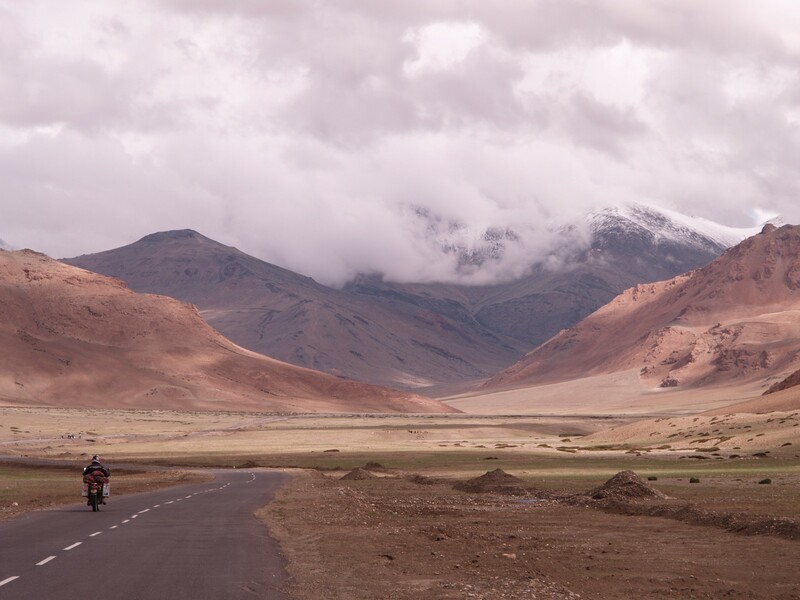 Mostly it was a barren, desolate landscape, but it was enlivened by occasional stretches of flat land that had been made arable by irrigation. 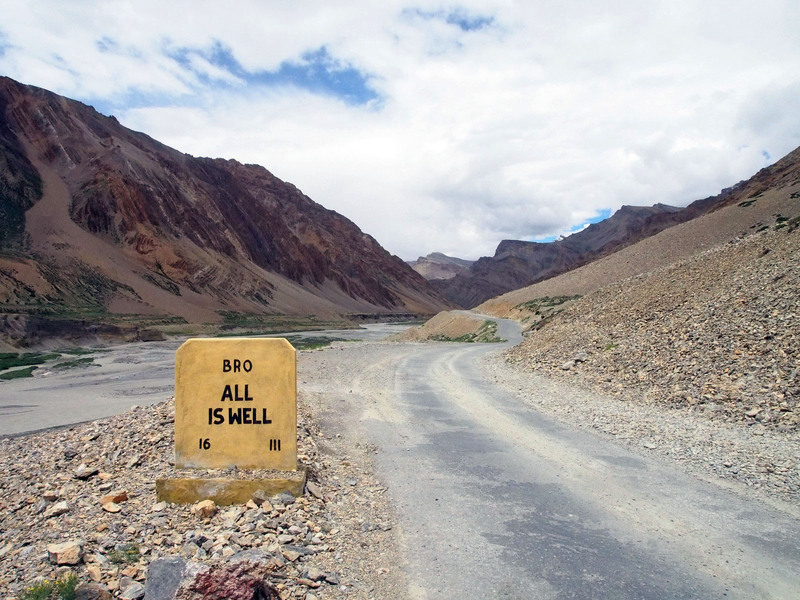 One final, amusing aspect of the Leh-Manali Highway are the road signs. 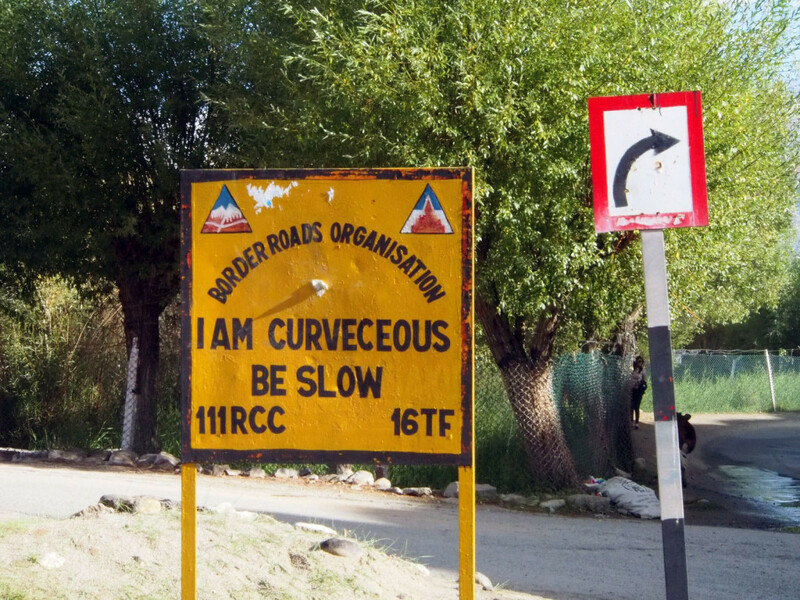 Set up by the Border Roads Organisation – an offshoot of the Army – they are frequently trite road safety messages, but are sometimes quite humorous and memorable. 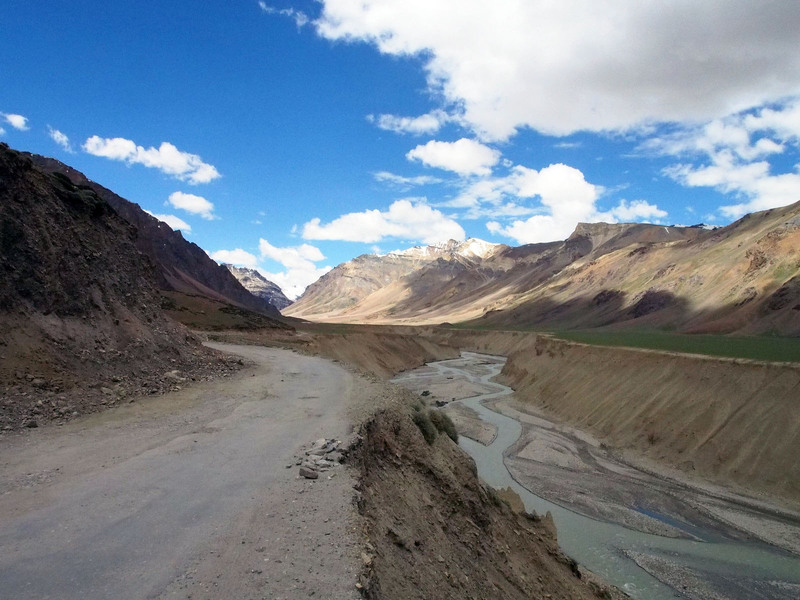 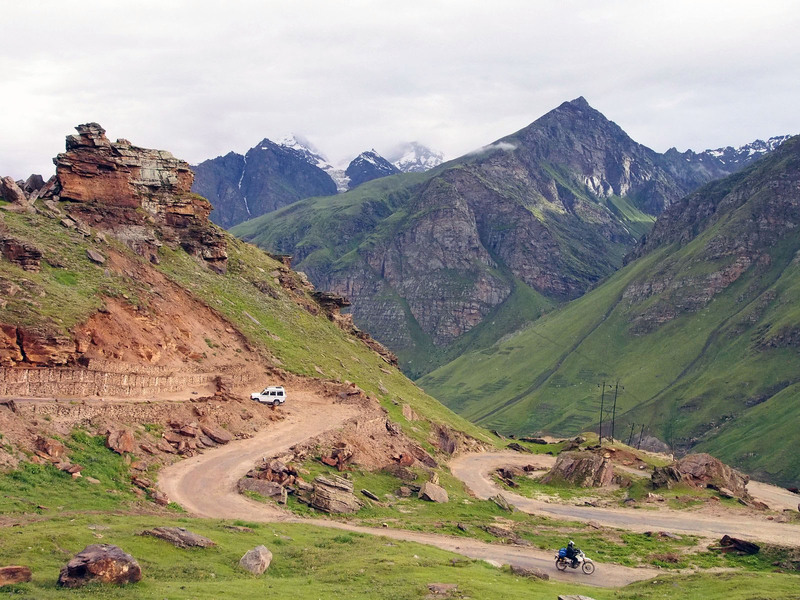 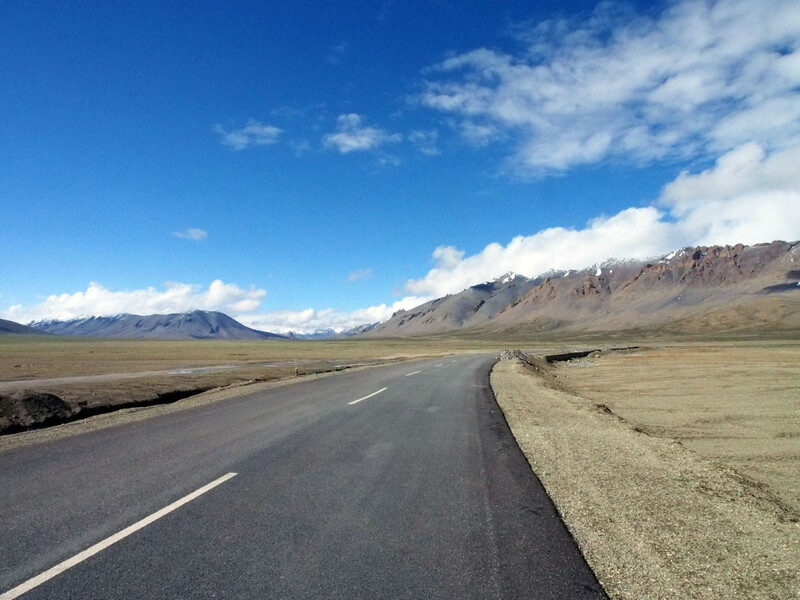 Fantastic shots along the road – extraordinary country! 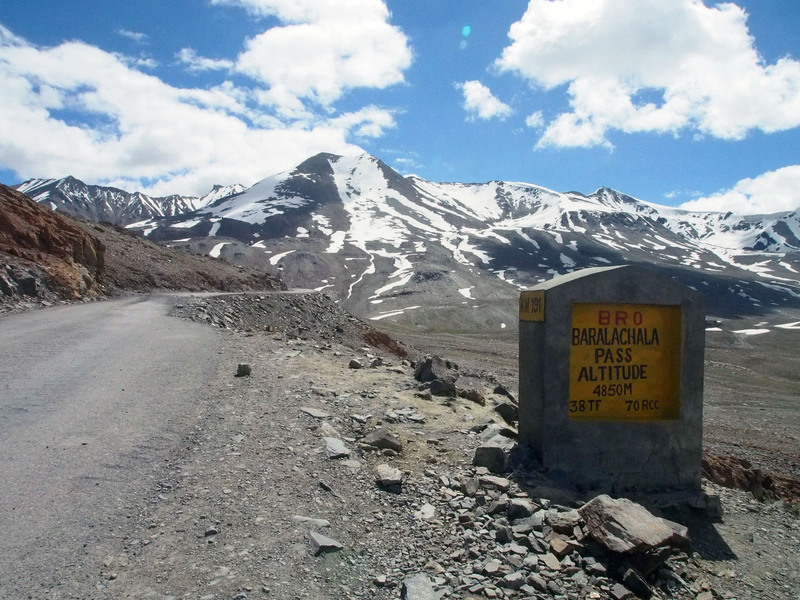 You are right – we must do this road!! 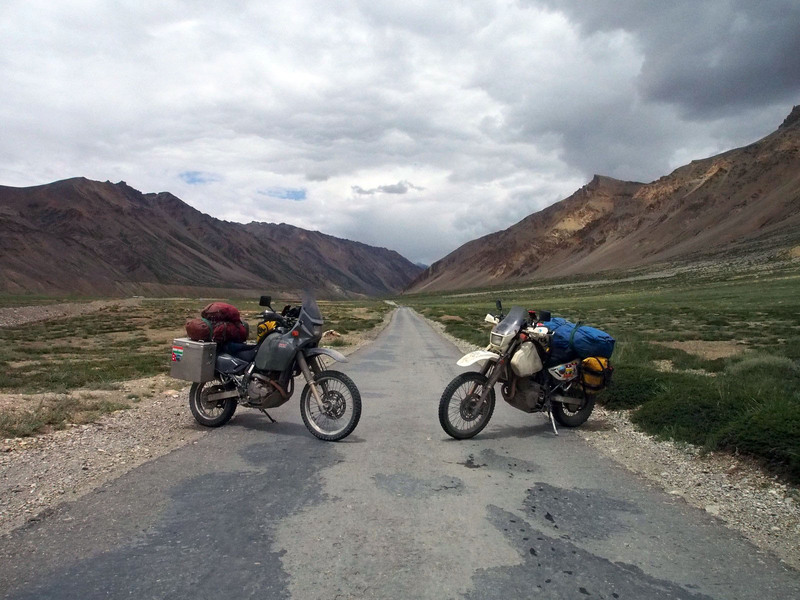 Love to you both.